Many bodily malfunctions are caused by inflammation. Physical and/or chemical forces irritate otherwise healthy cells, causing an increase, decrease, or change in function. We will consider only chemical forces. Although this Web page is divided into chapters, the subject of each one is by no means independent of the others. For example, there is a chapter on fat and another chapter on blood sugar. Fat affects blood sugar, and blood sugar affects fat. Most of the information and illustrations in this Web page were taken from other Web pages. I do not credit the sources because I do not claim any copyright to any of the material. If you're the copyright holder of any of the text or images contained herein, and you object to this usage, let me know which material is yours and I'll remove it. I have no way of knowing how accurate any of this information is, and so I encourage you to research anything you doubt. Hydrogen has 1 electron in its valence shell. It needs 2 electrons to fill the shell, so it forms 1 bond with another atom. Oxygen has 6 electrons in its valence shell. It needs 8 to fill the shell, so it forms 2 single bonds or 1 double bond with other atom(s). Carbon has 4 electrons in its valence shell. It needs 8 to fill the shell, so it forms 4 single, 2 double, or 1 double and 2 single bonds with other atoms. The molecule to the right is stearic acid (C18H36O2). The O and OH on the right form what's called the carboxyl end, and the other end is called the omega end. FAs such as this where all the carbons (except the rightmost) are "saturated" with hydrogens are called saturated fatty acids (SFAs). SFAs are solid at room temperature because their straight configuration allows them to pack tightly. The molecule to the right is oleic acid (C18H34O2). There is one double carbon bond, and since this uses two electrons from each carbon atom, each has only two bonds left. Since one from each is already bound to another carbon, each can bond with only one hydrogen atom. Note that the molecule bends because of the opposing negative charges of the hydrogen atoms. FAs such as this with one double bond are referred to as mono-unsaturated fatty acids (MUFAs). The molecule to the right is linoleic acid (C18H32O2). FAs such as this with two or more double bonds are called polyunsaturated fatty acids (PUFAs). Since the first double bond occurs at the 6th carbon from the omega end, it is sometimes referred to as an omega-6 FA. The molecule to the right is alpha linolenic acid (C18H30O2). The first double bond occurs at the 3rd carbon from the omega end, so it is sometimes referred to as an omega-3 FA. Note that it bends more than other FAs because of all the places where adjacent hydrogens repel each other. FAs are often denoted by a C:D nomenclature, where C = the number of carbon atoms and D = the number of double carbon bonds. For example, stearic acid is 18:0 and oleic acid is 18:1. This classification does not uniquely identify FAs, because two FAs can have the same number of carbons and double bonds, but differ in the positions of the double bonds. For example, alpha linolenic acid and an omega-6 FA called gamma linolenic acid are both 18:3, but their double bonds are not all in the same positions. The bent configuration of MUFAs and PUFAs makes them liquid at room temperature because they cannot pack very tightly. All unsaturated FAs can go rancid. Oxygen attacks them at the double bonds, causing lipid peroxidation. This forms lipid hydroperoxides, which, when ingested, damage body cells. For this reason, all PUFAs should be refrigerated, and they should never be used for frying because the heat greatly speeds up the rancidity (i.e. oxidation) process. (Oxidation of fats can happen inside the body too – see chapter 6.) The more double bonds an FA has, the more unstable (i.e. prone to oxidation) it is. In fact, alpha linolenic acid is so unstable that when it is pressed from seeds, it must be done in the total absence of light and oxygen. MUFAs do not oxidize as readily as PUFAs do. In nature, PUFAs are combined with antioxidants. For example, seed oils contain vitamin E. Antioxidants keep PUFAs from going rancid in plants. In order to prevent oils containing unsaturated FAs from going rancid, as well as make them solid at room temperature (e.g. margarine), they are often hydrogenated. The aim is to saturate the oil by breaking all the double bonds and filling the carbon atoms' valence shells with hydrogen so that oxygen can't attack them. This makes them solid at room temperature because the repelling hydrogen forces are equalized. Manufacturers begin with the cheapest oils - soy, corn, cottonseed or canola - and mix them with tiny metal particles, usually nickel oxide. The oil with its nickel catalyst is subjected to hydrogen gas in a high-pressure, high-temperature reactor. In partially hydrogenated oils, not all the PUFAs get completely saturated. Some double bonds remain, so the resulting substance is somewhat soft at room temperature because there are some places where repelling hydrogen forces can bend molecules. The more solid manufacturers want their product to be, the more they hydrogenate the PUFAs. In this case the two leftmost double carbon bonds have twisted. The twist at the 3rd and 4th carbons puts the remaining hydrogen "gaps" to their right on the top rather than the bottom of the molecule. The twist at the 6th and 7th carbons puts the remaining gaps back on the bottom. The unchanged double bond at the 9th and 10th carbons still allows the molecule to bend, but the other two bends have straightened out because the repelling hydrogen forces are equal on both sides. (If all three double bonds had twisted, the molecule would be mostly straight. If only one double bond had twisted, the molecule would be more bent than it is now, but less bent than it was originally.) This state in which one or more double bonds become twisted is called the trans configuration because hydrogen atoms on double-bond carbons are now on opposite rather than same sides of the molecule ("trans" means "across"). Hence this bastardized FA is called a trans fatty acid (TFA). Note that both twisting and hydrogenation can happen in the same molecule. For example, the double bond at the 9th and 10th carbons in the previous example could be broken, with hydrogens added to both carbons, thus straightening out the molecule. Some TFAs are formed when oil is heated above 320°F, which is why fried foods contain TFAs (they're fried at over 350°F), and why foods should be cooked in water rather than oil. Oil can be added after the heat has been turned off. Certain bacteria can convert cis FAs into trans FAs. This occurs in ruminants (cows, sheep, goats) where bacterial fermentation occurs in the rumen (forestomach). About 3-7% of the fats from the meat and milk of ruminant animals are trans FAs. The boiling point for most oils is somewhere between 400°F and 500°F, but they will begin to smoke at lower temperatures. The smoke point is around 300-350°F for unrefined oils, and 400-450°F for refined oils. Shortly before the smoke point, oils start to decompose rapidly. They form free radicals, the carcinogen acrylamide (if glucose and fructose are present, as when frying potatoes), and the toxin acrolein. So to be safe, never raise any oil above 300°F. Superunsaturated oils, such as flaxseed oil and fish oil, are highly unstable (the more double carbon bonds an FA has, the more unstable it is). Do not heat them above 212°F. To cook foods that already contain PUFAs (e.g. fish), either microwave just enough to cook without drying out, or boil in water (poach). Both methods keep cooking temperature down at water's boiling point (212°F). Oils are extracted from plant matter by several methods. The two main categories are cold extraction and heat extraction. Cold extraction keeps temperatures low, thereby preserving PUFAs. Cold extraction methods include cold pressing and vacuum extraction. Heat extraction methods include expeller pressing and solvent extraction. Cold pressing refers to oils obtained through pressing and grinding fruit or seeds with the use of heavy granite millstones or modern stainless steel presses. Although pressing and grinding produce heat through friction, the temperature must not rise above 120ºF for any oil to be considered cold-pressed. Vacuum extraction is similar to cold pressing with the added benefit that it occurs in an atmosphere with no oxygen or light. Expeller pressing is like cold pressing except that extreme pressure is used, producing heat as high as 300ºF through friction. In solvent extraction, chemical solvents are used to extract oil, which is then boiled to eliminate most of the solvents. The oil is then refined in order to reduce its instability, making it more appropriate for cooking at higher heats and extending its shelf life. However, the refining process itself involves high heat, plus it removes vitamins, minerals, flavor and aroma. If an oil's product label does not specifically say that it was cold-pressed or vacuum-extracted, it was probably obtained via heat extraction. Because MUFAs don't oxidize very quickly, olive oil (whose main FA is oleic acid) is somewhat resistant to rancidity. Short-chain SFAs include butyric acid (4:0), caproic acid (6:0), caprylic acid (8:0), and capric acid (10:0). Like unsaturated fats, they have melting points below body temperature. Higher-chain SFAs (12:0 and up) are solid at body temperature, and this allows them to give our cells rigidity where needed. Dietary fat is emulsified (made soluble in water) by bile salts that are synthesized in the liver and secreted from the gallbladder. The emulsified fats (mainly triglycerides, which are molecules consisting of glycerin and three FAs) are degraded by lipases (which are secreted into the intestine by the pancreas) into free FAs, monoglycerides and diglycerides. The intestinal mucosal cells absorb them, use them to resynthesize triglycerides (TGs), and package them in lipoprotein complexes called chylomicrons. The chylomicrons travel in the lymph system, which dumps them into the bloodstream. They are degraded to chylomicron remnants in the capillaries of muscle and adipose tissue through cleavage of most of their TGs by lipoprotein lipase. These remnants are rapidly cleared by the liver by receptor-mediated endocytosis. Meanwhile TGs synthesized in the liver (from excess dietary carbohydrates and lipids) are packaged into very low-density lipoproteins (VLDLs) and released into the blood. The TGs from both VLDLs and chylomicrons are hydrolyzed (split into glycerin and three FAs, with three molecules of water taken up) in the capillaries of adipose tissue and skeletal muscle by lipoprotein lipase. The free FAs are absorbed by the cells and the glycerol is returned via the blood to the liver and kidneys. Intermediate-density lipoproteins (IDLs) are formed as TGs are removed from VLDLs. IDLs are either converted to low-density lipoproteins (via lipoprotein lipase), or taken up by the liver. VLDLs and chylomicrons are the primary TGs transporters, the latter being larger and carrying more TGs. Low-density lipoproteins (LDLs), which are smaller than VLDLs and chylomicrons, are the primary means of delivering cholesterol to tissues. They contain the highest concentration of cholesterol of all the lipoproteins. LDL is spherical with an outer boundary composed of a single layer of phospholipid. It contains about 1500 molecules of cholesterol. Cholesterol is a steroid hormone that is necessary for vital processes such as the formation and maintenance of cell membranes, and the production of hormones and bile salts. It is also converted to vitamin D in the skin when exposed to sunlight. Cholesterol does not contribute to atherosclerosis; LDLs do (more on this in chapter 5). However, some LDLs are necessary because the cholesterol they deliver is essential for life. Tissues import cholesterol via LDL receptors on their cell surfaces. Embedded in LDL's phospholipid shell are large proteins called apolipoprotein B-100 (apoB-100), which are recognized by and bind to LDL receptors. ApoB-100 is also a component of VLDL. The amount of apoB-100 leaving the liver in VLDL is dependent on availability of TG and cholesterol. There are different forms of LDL. Low TG levels result in large or medium-sized LDLs that are cleared effectively by LDL receptors. High TG levels result in small LDLs that are cleared less avidly by LDL receptors. High-density lipoproteins (HDLs), which are the smallest lipoproteins, scavenge cholesterol and bring it either to the liver for reuse at another time, or to the bile for excretion. HDLs are synthesized in the liver and small intestine, nearly devoid of cholesterol. 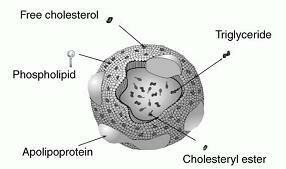 They pick up cholesterol (from cell surface membranes and other areas) and return to the liver, where they are absorbed. They contain apolipoprotein A (apoA) rather than apoB in their phospholipid shell (see chapter 5 for more information). Fat is a good insulator because it conducts heat only one-third as quickly as other tissues. It thus keeps you warm on a cold day, but makes you hotter in warm weather because of diminished heat loss. Body fat is metabolically active. Its TGs are constantly hydrolyzed and resynthesized. It produces several substances, discussed later. Linoleic acid (LA) and alpha linolenic acid (ALA) cannot be produced by the human body, so they are called essential FAs (EFAs). EFAs play a part in almost every function of our body – too many to list here. LA (18:2) is converted by the liver into other needed omega-6 FAs such as arachidonic acid (20:4), gamma linolenic acid (18:3) and dihomo gamma linolenic acid (20:3). ALA (18:3) is converted by the liver into other needed omega-3 FAs. However, the conversion of ALA into two of these, eicosapentaenoic acid (EPA) and docosahexaenoic acid (DHA), is an inefficient process: only about 6% of ALA is converted to EPA and 3.8% is converted to DHA. Therefore both EPA and DHA, while not completely essential, should be included in the diet. EPA (20:5) promotes a healthy cardiovascular system by regulating the formation of healthy body prostaglandins. It modulates inflammatory processes, including platelet aggregation. DHA (22:6), the most polyunsaturated fatty acid, makes up 60% of the structure of the photoreceptors in the eye. DHA is important for normal growth and development, brain and neural functions, and visual function. Breast milk contains DHA. Infants fed formula have a lower proportion of DHA in their brains and retinas than those fed breast milk. Because omega-3 and omega-6 FAs must compete for the same desaturation and elongation enzymes, high dietary intake of omega-6 FAs can further reduce the conversion of ALA to EPA and DHA by 40-50%. Omega-6 and omega-3 FAs should be consumed in a ratio no higher than 5:1. If more omega-3 than omega-6 FAs are consumed, the ratio of omega-3 to omega-6 should be no more than 2:1. See chapter 9 for dietary sources of all EFAs. Too much omega-6 FA intake can cause high blood pressure, blood clots, heart disease, cerebrovascular disease, cancer, water retention, and allergic hyper-reactivity, because eicosanoids (prostaglandins) formed from omega-6 FAs are more potent in stimulating inflammatory responses than are those formed from omega-3 FAs. Omega-3 FAs help lower TG levels. What they do to HDL and LDL levels is a matter of debate. SFAs can contribute to heart disease, but not necessarily by affecting lipoprotein levels. Palmitic, lauric, and especially myristic acids increase LDL, but they can also increase HDL, thus having little effect on their ratio. Stearic acid and short-chain SFAs have little effect on LDL and HDL. The primary way in which SFAs contribute to atherosclerosis has to do with blood clotting. Platelets are the circulating cells that are primarily responsible for initiating blood clotting, usually by adhering to damaged blood vessels. Platelet aggregation is a function of membrane fluidity as well as the production of two eicosanoids: thromboxane (TXA), which is an aggregation promoter synthesized by platelets; and prostacyclin (prostaglandin I, or PGI), which is an aggregation inhibitor produced by arterial endothelial cells. Both TXA and PGI are derived from arachidonic acid, which is a long-chain omega-6 PUFA and an essential component of the phospholipids in cell membranes. Diets rich in SFAs may promote clotting within blood vessels (thrombosis) by decreasing platelet membrane fluidity and increasing platelet sensitivity to aggregating agents, though which particular SFAs are the most thrombogenic is debated. It has been suggested that palmitic acid causes more platelet aggregation than stearic acid does. Diets high in PUFAs increase platelet membrane fluidity and decrease platelet sensitivity to aggregating agents, thus decreasing the tendency for platelets to aggregate. Furthermore, EPA and DHA, and to some extent LA and oleic acid, can replace arachidonic acid in platelet membranes, thus decreasing the precursor for TXA production and thereby reducing platelet aggregation by increasing the ratio of PGI to TXA. DHA and EPA can also lower mean platelet volume. While these factors lower the probability of atherosclerosis, they also increase the likelihood of hemorrhagic stroke. (For example, the incidence of hemorrhagic stroke in Japan has decreased since the Westernization of their diet reduced the amount of EPA and DHA consumed.) Thus the importance of dietary balance. For more on blood clotting, atherosclerosis and hemorrhagic stroke, see chapter 5. SFAs – particularly palmitic and myristic acids – contribute to insulin resistance (IR), which is decreased sensitivity of muscle and fat cells to insulin (more on IR in chapter 3). SFAs are necessary for life. They compose at least 50 percent of our cell membranes, providing essential rigidity and strength. They help incorporate calcium into our bones. The heart uses them for energy. They boost the immune system. But since the human body produces all the SFAs it needs (from carbohydrates), we don't have to eat them. Lauric acid, found in large quantities in mother's milk, has antimicrobial properties. It is also an anticaries/antiplaque agent. It is made only by the mammary gland and not in the liver like other saturated fats, so there is speculation that it is an "essential SFA". TFAs are harmful in several ways. They compete with EFAs for the enzyme systems involved in transforming EFAs into other long-chain PUFAs. They increase the risk of cancer by interfering with liver detoxification and changing B and T immune cell ratios. They raise LDL and may reduce HDL. Additionally, TFAs can replace cis FAs (CFAs) in cell membranes (which usually have one SFA alongside one CFA, producing the right blend of stiffness and flexibility), resulting in stiffer cell membranes (because TFAs are stiffer than CFAs). This decreases cells' ability to transport nutrients across their membranes. Also, since our smallest capillaries are so narrow that blood cells have to travel single file, stiffer blood cells and capillaries can mean slower blood cell movement, further impeding the delivery of nutrients and oxygen and thereby decreasing stamina. Consuming enough EFAs will minimize the incorporation of TFAs into cell membranes. Oleic acid (18:1) is the most common MUFA. Human body fat is almost half oleic acid. It appears to be neutral in regard to LDL, and raises HDL modestly. Dietary sources of this and other MUFAs are listed in chapter 9. One does not need to eat much fat in order to gain bodily fat. Excess carbohydrates turn into excess blood sugar, which is converted to body fat. Additionally, the extra insulin produced by the pancreas to take up the sugar prevents us from burning body fat. This is why high-carb low-fat diets often don't work. Long-chain PUFAs, MUFAs and SFAs are more likely to contribute to the buildup of body fat than are short- and medium-chain FAs, which are readily oxidized to energy. A little SFA is not harmful. For example, stearic acid is desaturated to oleic acid in the liver. It is only when dietary SFA exceeds enzymatic capacity to handle it that it becomes a problem. Changes in plasma LDL concentration are secondary consequences to changes in liver metabolism of dietary cholesterol and FAs. When the liver is enriched with dietary SFAs (12:0, 14:0, 16:0), cholesterol is shifted into a "regulatory pool" and out of an "ester pool." This results in a decrease in the level of liver LDL receptor activity and an increase in the LDL production rate. Fat may raise the risk of cancer (particularly colorectal cancer) by 1) increasing energy intake, 2) acting as a solvent for carcinogens, 3) increasing the secretion of bile acid, and 4) increasing the production of eicosanoids that promote tumor growth. High intakes of EPA and DHA inhibit tumor growth. Fat encourages muscle to reject glucose as an energy source. To keep this sugar from building up in the blood, the pancreas produces extra insulin. Over time, the pancreas can become overworked, losing its ability to compensate, leading to IR and diabetes (see chapter 3). Obesity causes a rise in the inflammatory cytokine tumor necrosis factor-alpha (TNF-alpha), resistin, and IL-6 (these promote IR); IL-1, haptoglobin, and iNOS (inflammatory); IL-8 and IL-18 (atherogenic); type 1 plasminogen activator inhibitor (PAI-1) and FVIIc (coagulant); monocyte chemotactic protein-1 (atherogenic; promotes IR); and C-reactive protein (possibly inflammatory and atherogenic). Body fat produces leptin, a hormone that controls hunger (by acting on the hypothalamus) and speeds metabolism (by increasing thyroid activity). More fat means more leptin, which reduces appetite; less fat means less leptin, which increases appetite. Leptin also reduces the amount of stress hormones the body can release, and helps support the immune system. Conversely, caloric restriction up-regulates stress hormones and down-regulates thyroid hormones (possibly by limiting leptin's effects). So some body fat is necessary for optimal health. The majority of obese humans with high levels of leptin show a leptin insensitivity on the leptin receptor level (leptin acts through a cell surface receptor), so they are less affected by leptin, e.g. appetite might not be suppressed. Thus leptin insensitivity can perpetuate obesity. An adipocytokine called adiponectin circulates abundantly in human plasma, and exhibits both anti-atherogenic and anti-diabetic effects. Despite the fact that adiponectin is produced only by adipose tissue, plasma levels are decreased in obese patients and type-2 diabetic patients, while body weight reduction increases circulating adiponectin. Adiponectin is positively correlated with insulin sensitivity, but it is not known whether one causes the other. Adiponectin decreases hepatic gluconeogenesis (see chapter 3 for definition) and increases lipid oxidation in muscle. It inhibits primary tumour growth via increased tumor cell apoptosis (see chapter 11 for a description of apoptosis). There are three fat receptors, called peroxisome proliferator activated receptors (PPARs). PPAR-gamma, found mostly in adipose tissue, is required for adipose tissue storage. It drives the formation of fat cells and regulates the storage of fat. By taking fat from the blood, PPAR-gamma encourages muscle to burn sugar and allows the body to remain sensitive to insulin. Deficiency of PPAR-gamma can cause fatty liver; insulin resistance in fat and liver (but not in muscle), which results in excess hepatic glucose production; and lipodystrophy (too much or too little fat in certain areas of the body). PPAR-alpha, which is found in high levels in the liver, and PPAR-delta, found mostly in skeletal muscle, enable you to burn fat. PPAR-delta (also known as PPAR-beta) revs up cellular fat-burning pathways and beefs up slow-twitch muscle mass. This type of muscle, highly developed in marathon runners and migrating birds, prefers to use fat as an energy source. SFAs are least able to bind to PPARs, so they bypass the receptors, don't activate much of the fat-burning pathway, and get stored. Hence SFAs tend to get tucked away, while PUFAs are more readily consumed for energy. A nonfat diet can cause fatty liver due to reduced leptin levels. Leptin represses a liver enzyme called stearoyl-CoA desaturase-1 (SCD-1). SCD-1 catalyzes the production of monounsaturated fats from FAs in the liver and other tissues. Insufficient leptin level raises SCD-1 level and more fat is stored in the liver. Although obesity can cause insulin resistance, some adipose tissue is needed to maintain insulin sensitivity. Whether it's the PPAR-gamma or the adipose tissue itself that does this is debated. Surgical removal of visceral adipose tissue (VAT) leads to dramatic improvements in peripheral and hepatic insulin sensitivity and glucose tolerance, whereas removal of subcutaneous adipose tissue (SAT) has very little effect on these. VAT removal is also associated with decreased plasma concentrations of both insulin and leptin. Metabolic imbalance leads to immune imbalance, with starvation and immunosuppression on one end of the spectrum and obesity and inflammatory diseases on the other end. Resistin is a hormone secreted by adipose and other tissues (pancreatic islets, macrophages, bone marrow). More body fat means more resistin. It reduces insulin sensitivity and glucose uptake, thereby raising blood sugar. The enzyme insulinase, found in the liver and kidneys, breaks down blood-circulating insulin, resulting in a half-life of about six minutes for insulin. In the absence of sufficient dietary fat, the body synthesizes the FAs it needs from carbohydrates. It makes mainly palmitic acid, especially on very-low-fat diets with a high ratio of sugar to starch. The palmitic acid undergoes elongation to form longer-chain SFAs. Olestra is a synthetic fat, marketed under the trade name of Olean. It mimics the texture and properties of TGs. It's fat soluble, but not digestible or absorbed into the body. Its molecules have six to eight FAs attached to sucrose rather than a glycerol molecule, so the lipase digestive enzymes can't hydrolyze the ester bonds. The shorter or more unsaturated an FA is, the easier it is mobilized during fat store depletion. There are more than 50,000 different proteins in our bodies. They're all made from about 22 different amino acids (AAs), most of which our bodies can synthesize. The essential AAs are isoleucine, leucine, lysine, methionine, phenylalanine, threonine, tryptophan and valine. (Young children also require histidine and arginine.) This list is debated, but which particular ones are essential isn't important because the bottom line is that we have to obtain the essential AAs from food. We recycle 100-300 grams of our own protein every day. We have an AA pool in our body from which we take AAs to build new ones, and to which we add AAs by breaking down endogenous and exogenous protein. However, we lose protein through skin, sweat, hair, urine and feces, and it is those lost AAs that we need to replace. Proteases in the stomach and small intestine break dietary protein down into its constituent AAs. In the bloodstream, AAs can be 1) consumed immediately as an energy source, 2) used to make a protein the body needs, 3) processed into another AA, or 4) used to make hormones and biochemicals. When protein is consumed in excess of needs, the amino groups (NH2) are removed by the liver (deamination). NH2 readily picks up an extra H+ to form NH3 (ammonia), which is extremely toxic to the body, so in the liver it combines with CO2 to form urea plus water. Urea is then filtered out by the kidneys and excreted in urine. Thus excessive protein intake increases the workload of the liver and kidneys. Meanwhile, the carbon skeletons left over after deamination are converted to FAs which will combine with glycerol to form TGs, which, if not used for energy, will be stored as body fat. When very high levels of protein are consumed, calcium loss through the urine increases. Insufficient protein can depress the immune system (antibody production is diminished), as well as cause edema (fluid leaks from blood vessels into body tissues) and emotional disturbances (due to reduced hormone production). If insufficient calories are consumed, dietary protein is not used for growth and repair, but is instead broken down into glucose to feed the brain. Only when the brain has all the glucose it needs will remaining dietary protein (if any) be used for growth and repair. The liver produces glucose in at least two ways: 1) glycogenolysis, in which glycogen is broken down into glucose; and 2) gluconeogenesis, in which non-carbohydrate sources such as lactate, glycerol (from fat), and AAs (from protein) are converted into glucose. Pancreatic alpha cells secrete a hormone called glucagon in response to low blood glucose levels. Glucagon, a linear peptide of 29 AAs, stimulates glycogenolysis and gluconeogenesis so glucose may enter the bloodstream and raise blood glucose levels. It inhibits glycogenesis (glycogen synthesis from glucose) and glycolysis (breakdown of glucose) in the liver. It also increases lipolysis (breakdown of fat stored in fat cells, releasing FAs). Pancreatic beta cells (located in the islets of Langerhans) secrete a hormone called insulin in response to high blood sugar. It is directly infused via the portal vein to the liver. It does the opposite of what glucagon does: it turns off glycogenolysis and gluconeogenesis, inhibits lipolysis, and increases glycogenesis, glycolysis, TG synthesis, FA synthesis, and protein synthesis. As it circulates it increases glucose uptake in skeletal muscle and, to some degree, adipocytes, by making a glucose transporter (GLUT) called GLUT4, which is normally present in cytoplasmic vesicles, available in the plasma membrane, where it allows glucose to enter cells. Once inside cells, glucose is used for energy or converted to complex carbohydrates and fat. Insulin increases lipoprotein lipase (LPL) activity in fatty tissue. The LPL hydrolyzes TGs from circulating chylomicrons and VLDLs, and the resulting free FAs (FFAs) enter the adipocytes. Then the FFAs are combined with glycerol (synthesized from glucose, which enters the cells with insulin's help) to make TGs, which are stored until needed for energy. (This fat storage process is called lipogenesis.) At the same time, insulin inhibits breakdown of fat in adipose tissue by inhibiting the intracellular lipase that hydrolyzes TGs to release FAs. Insulin thus increases body fat. Insulin stimulates the uptake of AAs, and insufficient insulin causes intracellular protein degradation. So, like many other chemicals, insulin is needed, and only an excess is bad. Type 1 diabetes (T1D) requires both a genetic predisposition and an environmental trigger. When one identical twin has T1D, the other gets it about half the time. Early exposure to cow's milk in genetically susceptible infants has been documented to trigger T1D. It is a mycotoxin in the milk, not the milk itself, that causes it. T1D is less common in people who were breastfed and in those who first ate solid foods at later ages. T1D occurs when the body's immune system attacks and destroys beta cells. Coxsackie viruses (polio-related viruses that cause upper respiratory infections) can trigger this. An enzyme called glutamic acid decarboxylase (GAD), which is found on the surface of beta cells, has a small segment that is structurally similar to a segment of a coxsackie protein. When the immune system attacks this viral protein in fighting off a coxsackie infection, it also inadvertently attacks GAD, and hence beta cells. Insulin deficiency caused by T1D causes a host of problems, such as protein degradation and hyperglycemia. However, we will focus only on the more preventable type: type 2 diabetes (T2D). T2D also requires both genetics and a trigger. When one identical twin has T2D, the other's risk is 3 in 4. High intake of sugar raises blood glucose (BG), which forces beta cells to overproduce insulin on a daily basis. The resulting hyperinsulinemia causes cells to become insulin resistant as a defensive response to the toxic effects of insulin. They down-regulate their receptor activity and number of receptors. (The liver becomes resistant first, followed by the muscle tissue and lastly the fats.) Thus less glucose is removed from blood in response to insulin. Because BG remains high, the beta cells produce even more insulin in order to lower BG. This can increase insulin resistance (IR), which perpetuates the upward spiral of both BG and insulin. High BG (hyperglycemia) hurts beta cells in three ways: 1) Glucose desensitization. Beta cells don't respond as they should to a short exposure of elevated glucose. 2) Exhaustion. After being whipped like tired horses for too long, beta cells lose their ability to produce the greater quantities of insulin required by a bad diet. 3) Glucose toxicity. Glucose binds to proteins in a process called glycation (also called glycosylation). Hyperglycemia causes the formation of toxic advanced glycation end products (AGEs), for example, glycated Cu,Zn-superoxide dismutase (Cu,Zn-SOD). These can injure beta cells via oxidative stress. All three of these effects are reversible up to a point, after which they become irreversible, at which point it is called T2D. AGEs also injure nerves and blood vessels, which is why diabetics often develop nervous and circulatory problems, the latter notoriously affecting the eyes (retinopathy), feet (gangrene) and kidneys (nephropathy). IR causes an increase in the delivery of peripheral FAs to the liver, which in turn drives up hepatic TG synthesis. These TGs are then packaged into VLDLs (LDL precursors), which are returned to the circulation. Thus IR can raise LDL levels and contribute to atherosclerosis (more on this in chapter 5). As was mentioned in chapter 1, fat encourages muscle to reject glucose as an energy source, so excessive fat intake can contribute to T2D. In T2D, alpha cell mass is increased, and there is an exaggerated glucagon response to AAs and impaired suppression of glucagon secretion by hyperglycemia. Hyperglucagonemia contributes to IR and hyperglycemia. Type 2 diabetes used to be called adult-onset diabetes because it usually didn't appear until after age 40. Today, many American children are obese and are developing T2D at an epidemic rate. People who live in areas that have not become Westernized tend not to get T2D, no matter how high their genetic risk. Milk containing a peptide called bovine serum albumin (BSA) can trigger an autoimmune response that destroys beta cells. BSA has a 17-amino-acid (17AA) sequence that is identical to a 17AA sequence on beta cells. When a person develops an allergic reaction to BSA, the body develops antibodies to the 17AA sequence and it then mistakenly recognizes the pancreatic beta cells as being the same. The body will then destroy its own pancreatic cells. Exclusive breast-feeding can prevent this. Some sources report that fasting plasma insulin levels are increased with aging, due to impaired ability of insulin to suppress hepatic glucose production (HGP). Others report that body fat and its distribution impair hepatic insulin action, while aging per se has no significant impact. There is evidence for this claim: 1) suppression of HGP by insulin is significantly impaired in younger subjects who have abdominal obesity; 2) surgical removal of selected intra-abdominal fat in young rats led to a marked increase in hepatic insulin action. SFAs and omega-6 PUFAs are implicated in the promotion of IR, while omega-3 PUFAs exert a protective effect. Insulin helps store magnesium (which relaxes muscles and arteries). In IR, magnesium is lost through urination, possibly constricting blood vessels and raising blood pressure (BP). Conversely, magnesium is a cofactor for insulin action and plays a critical role in insulin sensitivity. Magnesium deficiency contributes to T2D. Hyperinsulinemia may elevate BP by enhancing the activity of the sympathetic nervous system, or by stimulating renal sodium reabsorption (which leads to water retention and volume expansion). Insulin is a master hormone that controls many anabolic hormones such as growth hormone, testosterone, and progesterone. Bone is built upon the command of such hormones. These hormones are reduced in IR, thereby reducing bone building and increasing calcium excretion. High FFA levels decrease the ability of the liver to store sugars, keeping sugars in the blood. Lipid peroxidation is increased in insulin-resistant individuals at an early, preclinical stage, well before the development of glucose intolerance and T2D. The glycemic index of a food refers to how quickly its carbohydrates enter the bloodstream and raise blood sugar. Carbohydrates that break down rapidly during digestion have the highest glycemic indices. An increased blood glucose response occurs very quickly, resulting in transient hyperinsulinemia. Carbohydrates that break down slowly have a low glycemic index. They keep insulin demand low and provide better long-term BG and blood lipid control. Excessive intake of all carbohydrates, especially the high-glycemic type, is the primary culprit in the development of IR. There are 3 consistent blood metabolic indicators of all centenarians: low BG, low TGs, and low insulin. The level of insulin sensitivity of the cell is one of the most important markers of lifespan. Visceral adipocytes are far more metabolically active than subcutaneous adipocytes. Release of FFAs from visceral fat is more pronounced than from subcutaneous fat, and visceral fat cells are less sensitive to suppression of lipolysis by insulin. The released FFAs can directly block insulin-signaling pathways, leading to IR. At least part of the reason behind beta cell failure is IR leading to elevated FFAs, which result in beta cell apoptosis. IR and subsequent hyperinsulinemia cause exaggerated responses in tissues that remain sensitive to insulin. Several serine/threonine kinases are activated by inflammatory or stressful stimuli (such as pathogens) and contribute to inhibition of insulin signaling. Hyperlipidemia leads to increased uptake of FAs by muscle cells and production of FA metabolites that stimulate inflammatory cascades, thus activating some of these kinases and inhibiting insulin signaling. The most abundant hormone is cortisol (also called hydrocortisone). Cortisol and the other glucocorticoids have potent anti-inflammatory effects on the body, for example, by depressing the immune response. Excessive glucocorticoid levels can inhibit bone formation, suppress calcium absorption, and delay wound healing. Short-term exposure to cortisol helps create detailed memories during a stressful event. Over the long term, exposure to cortisol suppresses the immune system; wastes muscle; raises BG; damages brain cells (especially those in the hippocampus, resulting in impaired learning); and blocks serotonin, contributing to depression. Glucocorticoids are secreted in response to a single stimulator: adrenocorticotropic hormone (ACTH) from the anterior pituitary. ACTH is secreted under control of the hypothalamic peptide corticotropin-releasing hormone (CRH). The central nervous system is thus the commander-in-chief of glucocorticoid responses. Any type of physical or mental stress results in elevation of cortisol due to enhanced secretion of CRH in the hypothalamus. There seem to be no cells that lack glucocorticoid receptors and as a consequence, these steroid hormones have a huge number of effects on physiologic systems. In the fasted state, cortisol helps increase and maintain blood glucose by stimulating gluconeogenesis, mobilizing AAs (gluconeogenesis substrates) from extrahepatic tissues, inhibiting glucose uptake in muscle and adipose tissue, and stimulating lipolysis (the FAs are used for energy, and the glycerol provides gluconeogenesis substrate). This excess glucose, if not burned in fight or flight, is typically converted into and stored as fat. Overconsumption of simple carbohydrates triggers a strong insulin response, which in turn can trigger a dramatic drop in blood sugar ("sugar crash") after the consumed carbohydrate is gone and the remaining insulin removes even more glucose from the blood. This triggers a surge of adrenal stress hormones, including adrenaline and cortisol. High levels of cortisol raise leptin levels, heart rate, blood pressure, and insulin production; and increase potassium excretion. Dehydroepiandrosterone (DHEA) is a feel-good hormone that is elevated during meditation and exercise. It reduces cortisol, the conversion of glucose to fat, and excess insulin. It also decreases appetite by increasing levels of cholecystokinin, the hormone that tells your brain you've had enough to eat. Excessive secretion of growth hormone, adrenaline, noradrenaline, cortisol, glucagon and thyroid hormones, which maintain or raise blood glucose levels, are brought into operation by emotional stress. The layer of the artery that is in direct contact with the flow of blood is called the tunica intima, or intima for short. It's made up mainly of endothelial cells. Under normal conditions, nothing sticks to it. Just deep to this layer is the tunica media, known as the media. It's made up of smooth muscle cells and elastic tissue. The outermost layer is known as the tunica adventitia, or simply the adventitia. It's composed of connective tissue. Atherosclerosis is a combination of immune response and wound healing. Inflammation plays a fundamental role in its development. Anything that irritates the intima, such as free radicals, high blood pressure, bacterial endotoxins (e.g. lipopolysaccharide), pH imbalance, etc, can cause the injured areas to accumulate LDL and other materials that might build up to the point where they partially or completely block blood flow. This happens only in arteries, not in veins, because arterial smooth muscle cells have binding sites (receptors) for apoB-100, which is found on LDL. Stage 1: Inflammation (i.e. damage) of the intima triggers monocytes (a type of white blood cell) to adhere to the artery wall, then move into the subintimal space and become macrophages. The PUFA component of LDL is oxidized (lipid peroxidation) by free radicals released by endothelial cells, arterial smooth muscle cells and macrophages, creating oxidized LDL (OxLDL). The macrophages engorge themselves with OxLDL (their phagocytic activity is not regulated) and take on a foamy appearance, at which point they are referred to as "foam cells". They form yellow "fatty streaks". They eventually die, causing more inflammation. Intima damage also triggers platelets to adhere and aggregate at the site. The intima's endothelial cells normally release nitric oxide, which causes vasodilation, inhibits platelet adhesion to the intima (antithrombotic), and inhibits leukocyte adhesion to the intima (anti-inflammatory). Damage to endothelial cells reduces or stops their nitric oxide production, causing vasoconstriction, platelet adhesion and leukocyte adhesion. Stage 2: Platelet aggregation results in the release of platelet-derived growth factor, which stimulates smooth muscle cell proliferation. The muscle cells secrete collagen, elastin and proteoglycans, leading to the formation of fibrous tissue (called a plaque or an atheroma). Typically the core consists of macrophages and smooth muscle cells with elevated cholesterol, and a fibrous cap covers the core. The core can become necrotic. Plaque is composed primarily of unsaturated fats (particularly PUFAs), not saturated fat. A plaque often causes stenosis (narrowing of the lumen) and some atrophy of the muscular layer. Sufficient atrophy can cause the artery to bulge (aneurysm) due to blood pressure. The bulge can eventually rupture and cause life-threatening internal bleeding. Aneurysms most commonly occur in the arteries at the base of the brain (the circle of Willis) and the aorta, particularly the abdominal (descending) aorta. Another potential problem is aortic dissection, which is most common in the ascending aorta. Blood penetrates the intima and enters the media. The high pressure rips the media apart, allowing more blood to enter and creating a false lumen that propagates along the aorta. As with an aneurysm, a dissection can rupture. Stage 3: The plaque breaks open. The fibrous cap can be lysed by several factors, such as matrix metalloproteinase (secreted by foam cells) or infection. Exertion (exercise or stress) can also rupture plaques due to mechanical shear stress from increased arterial contraction and pressure. The atheroma tissue fragments are exposed and released. They are very clot promoting; they attract platelets and activate blood-clotting proteins. This leads to both a clot covering the rupture (complicated lesion) and clotting on the released debris. The result is usually only partial stenosis, which often partially re-opens with healing and regrowth of the intima; but sometimes the combination of atheroma material release, bleeding into the atheroma bed, platelet accumulation and clotting quickly creates a complete or near complete obstruction. The blockage, either at the site of rupture (thrombosis) or as a result of debris being sent downstream (embolism), impedes blood flow, causing ischemia (lack of oxygen) or infarction (tissue death) of tissues fed by the blocked artery. Only about 14% of debilitating coronary events happen at locations with 75% or greater stenosis. The majority of events occur from plaque rupture at areas without sufficient stenosis to cause angina or stress test abnormalities. Plaques, especially those with calcification deposits, harden arteries. They restrict an artery's ability to dilate, which diminishes maximum blood-carrying capacity. While atherosclerosis, clots, embolisms and aneurysms can happen in any artery, the worst place they can happen is in the heart (heart attack) or brain (stroke), since myocardium and neurons do not regenerate. Heart attacks and strokes can be minor or major depending on how blocked an artery is and how much tissue it nourishes. A minor event is often an indication of risk of a major event. Strokes are divided into two classes: 1) Ischemic, which is due to blockage. 90% of strokes are ischemic. 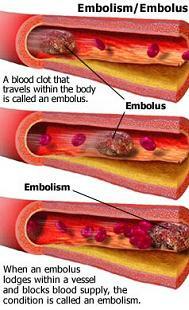 The blockage can be due to a plaque/clot (thrombotic) or a traveling particle that lodges in a sufficiently narrow artery (embolic). 2) Hemorrhagic (10% of strokes), which is due to a burst blood vessel that spills blood into the spaces surrounding brain cells (intracerebral) or the membranes that surround the brain (subarachnoid). Hemorrhagic strokes have higher fatality rates than ischemic strokes. Unfortunately, when blood flow is interrupted and subsequently restored in the brain, tissues release iron that provides a catalyst for the formation of free radicals that often permanently damage brain cells (see chapter 6 for information about iron's role in free radical generation). Even without a noticeable event, extensive narrowing and blockage of arteries are problematic. In the heart they can cause angina and inability to handle exercise or stress. In the brain they can cause dementia. They can also affect other organs (e.g. kidney failure). The involvement of monocytes/macrophages and blood clotting in atherosclerosis is unfortunate, but we must not eliminate them because without them we would succumb to pathogens or bleed to death from small cuts. The best way to prevent atherosclerosis is to reduce inflammation. LDL and clotting factors can be reduced, but this should be done moderately. High blood pressure (HBP) is a cause and an effect of atherosclerosis. Over time, HBP irritates intima cells, causing inflammation that starts the atherosclerotic process. Diminished dilating ability caused by an arterial plaque raises blood pressure in that area. Artery walls thicken in response to this increased pressure, further decreasing the ability to dilate. Over time, HBP can weaken an artery and cause an aneurysm, which can rupture. Vitamin C has vasodilatory and anticlotting effects within the body by stimulating nitric oxide release. Vitamin E helps to reduce production of prostaglandins such as thromboxane that cause platelet clumping. Homocysteine is a sulfur-containing AA formed in almost all tissues as methionine is metabolized (demethylated). It can be converted back to methionine (via remethylation), or converted to cysteine or taurine (via transsulfuration). An abnormally high level promotes atherosclerosis in several ways. It produces free radicals that damage intimal cells and oxidize LDL. It encourages clot formation. It induces the proliferation of vascular smooth muscle cells, which secrete extracellular matrix and give rise to a fibrous cap. Additionally, homocysteine thiolactone, a highly reactive byproduct of homocysteine oxidation, combines with LDL to form aggregates that are taken up by intimal macrophages and incorporated into foam cells within newly developing plaques. The vitamins folic acid, pyridoxine (B6), and cobalamin (B12) are necessary cofactors in converting homocysteine to methionine or cysteine, so a deficiency of any one of these can lead to elevated homocysteine levels. C-reactive protein (CRP) is an acute phase protein produced by the liver and/or fat cells in response to inflammation. Overweight people generally have elevated CRP levels. CRP level is a good predictor of cardiovascular disease, but it is not known whether it's a cause or an effect. Aspirin and statins significantly reduce CRP production. Acrylamide (from heated oil) causes a significant increase in plasma CRP and homocysteine concentrations. A bad diet in general can adversely affect circulation, cause fatigue and promote arterial plaques because elevated levels of cholesterol, glucose, glycoproteins, FAs and glycerol can cause blood thickening and clotting. Smoking promotes atherosclerosis. Components in tobacco smoke irritate endothelial cells; this inflammation encourages the movement of monocytes into the intima. Within minutes of exposure, endothelial cells exhibit cytoskeletal disruption and the breakdown of cell-cell junctions, losing their typical flat morphology and intact junctional complexes by contracting to form round cells with cytoplasmic protrusions, indicating open junctions. Leakiness of the endothelium allows plasma-derived growth factors to access the smooth muscle layer and stimulate smooth muscle cell proliferation. Long-term exposure to tobacco smoke causes endothelial necrosis (cell death that includes the release of inflammatory cytosolic constituents). Other effects of tobacco smoke are increased LDL, decreased HDL, vasoconstriction (raises blood pressure), increased platelet reactivity, increased fibrinogen and TXA (promote clot formation), and increased blood viscosity. Smokers have higher CRP levels than nonsmokers. The only effect of smokeless tobacco seems to be vasoconstriction. Vitamin C, resveratrol (see chapter 9), N-acetylcysteine (chapter 8), curcumin (the yellow pigment of turmeric), and Lipitor offer some protection against changes in intima morphology caused by tobacco (but only Lipitor and N-acetylcysteine reduce tobacco-caused necrosis). TFAs cause a significant increase in secretion of free radicals, TNF-alpha, matrix metalloproteinase, and other atherogenic substances. They may destroy endothelium integrity and cause plaque rupture. Resistin levels are increased by obesity, either directly by the presence of fat, or indirectly by causing macrophages to produce it in response to the low-level inflammation caused by obesity. Resistin increases bodily production of vascular cell adhesion molecule-1 (VCAM-1) and ICAM-1 (promote cell adhesion), and fibrinogen (coagulant). Another coagulant, FVIIc, rises following a fatty meal. Endothelial cells contain leptin receptors, and leptin increases the proliferation and survival of vascular intima. It also promotes immune function. However, it promotes platelet aggregation. VLDL secretion by the liver is increased directly or indirectly by high FFA levels, high-glycemic foods (especially sucrose and fructose), high-fat diet, ingestion of ethanol, diabetes, hyperinsulinemia, and fasting. Elevated levels of VLDLs and chylomicrons induce VCAM1 expression, which promotes adhesion of cells to the intima in Stage 1. This effect is exacerbated by inflammatory cytokines. VLDLs and palmitic acid (16:0) significantly increase VCAM1 in the presence of TNF-alpha. OxLDL is cytotoxic and can directly damage endothelial cells in Stage 1, causing even more inflammation; decreased nitric oxide release; and enhanced expression of vasoconstrictors, cytokines and adhesion molecules. It might be possible to slow atherosclerosis by decreasing OxLDL with the use of antioxidants such as beta-carotene and vitamins C and E, although they might not be able to reach the LDL in the injured intima before it is oxidized. On the other hand, they might offer another kind of protection: slowing free radical-caused intima injury. Not being overweight can deter atherosclerosis by raising blood levels of adiponectin, which accumulates where the intima is damaged and suppresses TNF-alpha-induced expression of adhesion molecules in vascular endothelial cells, neointimal thickening, and growth factor-induced proliferation of smooth muscle cells. Adiponectin also inhibits the expression of the scavenger receptor class A-1 of macrophages, resulting in markedly decreased uptake of OxLDL and inhibition of foam cell formation. The liver rapidly takes up palmitic acid for fat synthesis; thus palmitic acid is stimulatory to VLDL synthesis and can thus be atherogenic. Stearic acid, on the other hand, is thought by many sources to not be atherogenic because it has no effect on TXA or PGI, and the liver preferentially utilizes stearic acid for phospholipid rather than VLDL synthesis. Insulin promotes atherosclerosis by stimulating the proliferation of vascular smooth muscle cells, augmenting collagen synthesis in the vascular wall, increasing the formation of and decreasing the regression of plaques, and stimulating the production of various growth factors. Thus IR and high BG, which stimulate insulin production, are atherogenic. Another atherogenic property of high BG has to do with glycation and the formation of AGEs (see chapter 3). AGEs cause vascular inflammation via oxidative stress. Also, when collagen in artery walls is glycated, it tends to trap passing proteins, and this may promote cholesterol accumulation. Another atherogenic property of IR is that insulin-resistant fat cells have diminished TG storage capacity. As a result, TGs are hydrolyzed, releasing FFAs, which cause the liver to produce more TGs and VLDL. TG-enriched LDL is readily converted to small, dense LDL, which has greater atherogenic potential than normal LDL has because 1) it is more readily oxidized to OxLDL, and 2) it can pass through gaps between intima cells more easily. HDL moderates LDL oxidation: paraoxonase (an HDL-bound esterase) works with lecithin-cholesterol acyltransferase (LCAT) and platelet activating factor acetylhydrolase (PAFAH) to hydrolyze phospholipid hydroperoxides generated during LDL oxidation and prevent the accumulation of oxidized lipid in LDL. HDL also reverses the cytotoxic effects of OxLDL: degradation of precursors for reactive secondary lipid oxidation products inhibits apoB modification, rendering OxLDL a less effective ligand for receptor uptake and foam cell formation. HDL can reduce atheromas by picking up cholesterol from them and transporting it to the liver for excretion (reverse cholesterol transport). HDL can inhibit cytokine-induced cell surface expression of adhesion molecules, thus preventing monocyte adhesion to the arterial intima. ApoA-I and apoA-II are the major apolipoproteins of HDL. The ratio of apoA-I to apoA-II determines HDL's antiatherogenic properties, with apoA-I increasing and apoA-II offering no or possibly decreasing protection (e.g. apoA-I activates LCAT but apoA-II doesn't). HDL particles can be classified as larger, less dense HDL2; or smaller, more dense HDL3. Most plasma HDL is HDL3. Most HDL2 contains apoA-I only, and HDL3 usually contains both apoA-I and apoA-II. Although this might suggest that HDL2 is more antiatherogenic, HDL3 performs most of the adhesion molecule inhibition (but this could be simply because there is more HDL3 than HDL2). Statin drugs (e.g. Lipitor) inhibit HMG-CoA reductase, which is an enzyme that catalyzes the conversion of HMG-CoA to mevalonate in the cholesterol-production pathway (acetyl-CoA --> HMG-CoA --> mevalonate --> isopentenyl pyrophosphate --> squalene --> cholesterol). Thus cholesterol synthesis is inhibited. This stimulates hepatocytes to produce more LDL receptors, which increases LDL clearance from the circulation. The intake of fish oil deters atherosclerosis by decreasing TG levels. It can increase both HDL and LDL, but doesn't change their ratio. While too much LDL contributes to atherosclerosis, too little LDL can raise the risk of hemorrhagic stroke (probably because cholesterol is necessary for keeping blood vessels strong). Data to support this are based on the finding that people with a total cholesterol level (TCL) under 180 milligrams per deciliter (mg/dl) double their risk of hemorrhagic stroke compared to those with a TCL of 230. (The risk of thrombotic stroke is twice as likely in those with a TCL over 280 compared to those at 230. The optimal TCL for overall stroke prevention is around 200.) However, "safe" cholesterol levels have been artificially lowered over the years in order to create business for pharmaceutical companies. For example, a TCL under 200 used to be considered good. Now many doctors prescribe cholesterol-lowering medications (Lipitor, Zocor, etc, which selectively lower LDL rather than HDL) for patients with a TCL over 180. Or they focus on LDL, which is usually about 70% of TCL. An LDL level under 120 mg/dl used to be considered good, but now the goal of many doctors is to keep it below 100. By artificially lowering standards, all people with a TCL of 180-200, or an LDL level between 100 and 120, become potential cholesterol-lowering drug patients, thus creating millions of new customers. Remember, cholesterol is necessary for life, and LDL is the primary way this vital substance gets delivered to tissues. Cholesterol repairs blood vessel cracks and leaks that could otherwise cause strokes, hemorrhages, dizziness, neuropathy, dementia, blindness, etc. It is part of vascular plaques, but not the root cause (inflammation is). LDL is labeled "bad" cholesterol in the U.S. only because many more Americans are injured and killed by blockage than by hemorrhage of cranial and coronary vessels. The key to optimal health is to keep HDL and LDL levels in proper balance, not to eliminate as much LDL as is medically possible. Atoms are most stable in the ground state. An atom is considered to be "ground" when every electron in the outermost shell has a complimentary electron that spins in the opposite direction. A free radical is any atom that has at least one unpaired electron in the outermost shell and is capable of independent existence. A free radical is easily formed when a covalent bond between entities is broken and one electron remains with each newly formed atom. The unpaired electron makes a free radical highly reactive. When a free radical steals an electron from a surrounding compound or molecule, a new free radical is formed in its place. In turn the newly formed radical then looks to return to its ground state by stealing electrons with antiparallel spins from cellular structures or molecules. Thus the chain reaction continues and can be thousands of events long. Free radicals promote oxidation. A certain amount of oxidation is necessary for life. Food energy is extracted via oxidation. The immune system kills invading microbes with free radicals (macrophages and neutrophils contain a group of enzymes called the NADPH oxidase complex, which, when activated, generates superoxide radicals and hydrogen peroxide, the latter of which interacts with chloride ions present in the cells to produce hypochlorite [the active ingredient in bleach], which in turn destroys the pathogen). In excess, however, free radicals produce harmful oxidation that can damage cell membranes and cell contents. Any free radical involving oxygen can be referred to as reactive oxygen species (ROS). Oxygen-centered free radicals contain two unpaired electrons in the outer shell. Because electrons must have opposite spin to occupy the same orbit, electrons added to molecular oxygen must be transferred one at a time during its reduction, resulting in several highly reactive intermediates. The complete reduction of oxygen to H2O requires 4 steps and the generation of several free radicals and hydrogen peroxide (H2O2). H2O2 is not a free radical in itself because it contains no unpaired electrons, but it is considered an ROS because of its ability to generate highly reactive hydroxyl free radicals through interactions with reactive transition metals such as copper and iron, which have the ability to gain and lose electrons very easily. Iron is a major endogenous source of free radicals. It is unique among essential minerals, because there is no mechanism for its excretion once absorbed – it must be either used or stored, and excessive storage of iron promotes the generation of free radicals. As we age, we produce less of the transferrin transport protein that normally binds free iron. As a result, older individuals have higher levels of free iron within their tissues, including brain, and are therefore at greater risk of widespread free radical injury. PUFAs are abundant in cellular membranes and in LDL. The PUFAs allow for fluidity of cellular membranes. A free radical prefers to steal electrons from the lipid membrane of a cell, initiating a free radical attack known as lipid peroxidation. ROSs target carbon-carbon double bonds of PUFAs. The double bonds on the carbons weaken the carbon-hydrogen bonds, allowing for easy dissociation of the hydrogens. A free radical will steal the single electron from a hydrogen associated with a carbon at the double bond. This leaves the carbon with an unpaired electron and hence becomes a free radical. In an effort to stabilize the carbon-centered free radical, molecular rearrangement occurs. The newly arranged molecule is called a conjugated diene (CD). The CD then very easily reacts with oxygen to form a peroxy radical, which steals an electron from another lipid molecule in a process called propagation. This process then continues in a chain reaction. A free radical attack on a membrane often damages a cell to the point that it must be removed by the immune system. Lipid peroxidation damages arterial intima, so free radicals are atherosclerotic. Our air, water and food contain man-made chemicals that can promote free radicals, as well as cancer: sulfur dioxide (SO2), particulate matter, carbon monoxide (CO), nitrogen dioxide (NO2), ozone (O3), hydrocarbons, chlorine, heavy metals, benzene, and 1,3-butadiene, to name a few. We can minimize our exposure to these poisons by staying away from heavy traffic areas, filtering our water, and buying organic foods that are produced without pesticides and fertilizers. Exposure to sunlight generates free radicals that age the skin, causing roughness and wrinkles. Antioxidants neutralize free radicals because they are willing to give up their own electrons to free radicals. When a free radical gains an electron from an antioxidant it no longer needs to attack cells, so the chain reaction of oxidation is broken. After donating an electron, an antioxidant becomes a free radical, but it is not harmful because it can accommodate the change in electrons without becoming reactive. The human body has an antioxidant defense system. Antioxidants are manufactured in the body and extracted from food. There are two lines of antioxidant defense in a cell. The first line, found in the fat-soluble cellular membrane, consists of coenzyme Q10 (CoQ10), beta-carotene and vitamin E. CoQ10 helps to maintain vitamin E in its active (unoxidized, reduced) form. CoQ10 and vitamin E protect LDL from oxidation; CoQ10 is more potent on a per-molecule basis, but vitamin E is more important because its serum concentration is about 30-fold higher. The second line, found inside the cell, consists of water-soluble antioxidant scavengers such as vitamin C, glutathione peroxidase (GSH-Px), superoxide dismutase, and catalase. The GSH-Px system is key in the coordination of both defense lines. Peroxidases use reduced glutathione to stop peroxidation of cells by breaking down H2O2 and lipid peroxides. Selenium is an essential component of the GSH-Px system. The heart, kidney, lung, liver, pancreas, and muscle contain very high levels of selenium as a component of glutathione. Without selenium, the peroxidase enzyme cannot be formed and consequently antioxidant protection by the GSH-Px system is compromised. There are 8 forms of vitamin E: four tocopherols (d-alpha-tocopherol, d-beta-tocopherol, d-gamma-tocopherol, d-delta-tocopherol) and four tocotrienols (d-alpha-tocotrienol, d-beta-tocotrienol, d-gamma-tocotrienol, d-delta-tocotrienol). D-alpha-tocopherol protects against lipid peroxidation of PUFAs. D-gamma-tocopherol protects against nitrogen free radicals, and is a stronger antioxidant than d-alpha-tocopherol. The liver continually recycles d-alpha-tocopherol, but it secretes d-gamma-tocopherol into the bile, which eliminates it from the body. Vitamin E enrichment of endothelial cells down-regulates the expression of ICAM-1 and VCAM-1, thereby decreasing adhesion of blood cell components to arterial intima. Vitamin E also up-regulates the expression of cytosolic phospholipase A2 and cyclooxygenase-1, which leads to the release of prostacyclin, a potent vasodilator and inhibitor of platelet aggregation. Most vitamin E supplements are alpha tocopherols. Use natural (d-), not synthetic (dl-) alpha tocopherol, because the former is continually recycled by the liver. Antioxidants work best in combination, and in fact some antioxidants by themselves can be converted to harmful products. For example, free iron oxidizes vitamin C to produce the free radical dehydroxyascorbate. Vitamin E reduces oxidized vitamin C to the active antioxidant state. Vitamin C returns the favor: after vitamin E protects against lipid peroxidation by acting directly with oxygen radicals (singlet oxygen, lipid peroxide products, and the superoxide radical) to form a relatively innocuous tocopherol radical, vitamin C (with the help of glutathione) interacts with the tocopherol radical to regenerate reduced tocopherol. Vitamin C and glutathione reduce each other back to the active form. Alpha-lipoic acid (a sulfurous FA) keeps vitamin C, vitamin E, glutathione and CoQ10 in the active state. In short, some of the best antioxidants to take, either in food or supplement form, are vitamin C, vitamin E (as d-alpha-tocopherol), selenium, CoQ10, alpha-lipoic acid, and glutathione. Many sources tell us that the body stores fat-soluble vitamins such as A, D and E, with excessive amounts causing harm; and flushes out water-soluble vitamins such as B-complex and C. However, vitamin C is stored in many tissues (not adipose tissue because it is not fat-soluble) and has a half-life of 16-20 days. Also, vitamin E toxicity is rare. Selenium toxicity happens only at extremely high doses, and even then the symptoms are not life-threatening. Studies have found that antioxidants may interfere with the protective action of drugs intended to improve cholesterol levels. Uric acid (not to be confused with urea), a metabolic breakdown product of nucleic acids in DNA (purines), is found in serum at concentrations ten-fold higher than those of vitamin C and offers significant antioxidant activity. Its concentration can be increased by eating nucleic acid-rich foods, such as yeast and sardines, or by accelerating purine breakdown by drinking alcoholic beverages. However, high levels of uric acid can result in the precipitation of uric acid crystals, which can cause gout (accumulation of uric acid crystals in joints, causing pain) or nephropathy (kidney damage). Trained individuals have an increased lipolytic (fat breakdown) capacity compared to sedentary persons. Exercise promotes vasodilation: shearing forces acting on the vascular endothelium stimulate calcium release and increased production of the vasodilator nitric oxide. At rest, about 33% of the body's energy comes from carbohydrates (which are metabolized quickly) and about 66% comes from fat (metabolized slowly). Low- to moderate-intensity training uses about 50% carbohydrates and 50% fat. Since fat metabolism requires oxygen, this is called aerobic metabolism. High-intensity training (e.g. sprinting, power lifting) causes muscles to shift to 100% carbohydrate usage for quick energy. Since sugar metabolism does not require oxygen, this is called anaerobic metabolism. Protein normally contributes less than 2% of energy requirements. When glycogen stores are low, the portion of energy derived from protein will increase (lean tissue's protein is converted to glucose). The body stores very little glycogen – less than a day's worth. Therefore exercising for several hours or without eating carbohydrates can break down muscle tissue. At low exercise intensity, blood lactic acid (lactate) concentration remains unchanged from resting values. As the intensity increases to about 60-80% of maximal workload and oxygen consumption, lactate concentration starts to increase progressively, because the proportion of energy derived from carbohydrate increases, and lactate is produced only from carbohydrate metabolism. Some organs and inactive muscles can take lactate from the blood and convert it to pyruvic acid to be metabolized in the mitochondria. Additionally, the liver can use lactate as a building block to resynthesize glucose. When lactate production exceeds removal, it builds up, and the protons that dissociate from lactate inhibit muscle contraction, causing fatigue. Trained athletes are more efficient at lactate removal. After intense exercise the removal of lactate from blood occurs significantly faster during moderate exercise than at rest. Humans have two types of muscle fiber in a roughly half-and-half ratio. Fast-twitch fibers, employed in anaerobic metabolism, are used for quick power; they have lots of glycolytic enzymes but few lipolytic enzymes. Slow-twitch fibers, employed in aerobic metabolism, are used for long distance. They contain more myoglobin (the primary oxygen-carrying pigment of muscle tissues). Dark meat poultry is slow-twitch muscle; white meat is fast-twitch muscle. Fast-twitch fibers contract three times as fast as slow-twitch. Adenosine triphosphate (ATP) is the main source of energy for all muscle contraction. There are three enzyme systems for producing ATP. 1) When strength is required, ATP is created anaerobically from creatine phosphate (CP) and adenosine diphosphate (ADP). CP is depleted in just a few seconds, so maximum power can be maintained for only a few seconds, and CP is restored in 3-4 minutes. 2) When a burst of power is needed, anaerobic glycolysis converts glucose into ATP and lactate. The enzymes needed for this reaction are depleted in less than two minutes. 3) For endurance, ATP is produced by aerobic glycolysis from carbohydrates, fats and AAs. Carbohydrates metabolize the most efficiently and are therefore used first. If carbohydrates are not available, fat and AAs are used. Anaerobic muscle fibers are three to six times as large as aerobic fibers. Strength and burst training cause anaerobic fibers to increase in diameter as a result of an increase in intracellular protein fibrils. Exercise is a great BG regulator because the stretching of muscle fibers provokes them to take up glucose from the blood. Aerobic exercise has an added benefit: as FFAs become the major substrate for energy metabolism, plasma concentrations of insulin and glucose fall. Under normal conditions (at rest) the body's antioxidant defense system can easily handle free radicals that are produced. During increased oxygen flux (i.e. exercise) free radical production may exceed that of removal: 1) In oxidative metabolism, much of the oxygen consumed is bound to hydrogen during oxidative phosphorylation, thus forming water. As mentioned in the previous chapter, the complete reduction of oxygen to H2O requires the generation of free radicals along the way. 2–5% of oxygen consumed in respiration is not completely reduced to water, leaving free radicals behind. Thus, increased oxygen consumption increases free radical production. 2) Increases in epinephrine (adrenaline) and other catecholamines can produce oxygen radicals when they are metabolically inactivated. 3) Lactate can convert a weakly damaging free radical (superoxide) into a strongly damaging one (hydroxyl). All these effects are amplified in unaccustomed, strenuous, or chronic training. Hence exercise can cause lipid peroxidation and increase the need for antioxidants. On the plus side, the GSH-Px system increases as an adaptation to chronic exercise. Levels of glutathione reductase, which converts oxidized glutathione back to the reduced form, are elevated in both skeletal muscle and red blood cells after exposure to chronic exercise. Studies show that trained athletes exhibit less evidence of lipid peroxidation for a given bout of exercise than do untrained subjects. Humans have at least six slightly different alcohol dehydrogenases. The version of alcohol dehydrogenase in women is less effective than that in men, which is part of the reason that women have a lower alcohol tolerance. Acetaldehyde (AH), also known as ethanal, is a highly reactive flammable liquid with a strong fruity smell. It boils at 70°F. It occurs naturally in ripe fruit and coffee, and is produced by plants as part of their normal metabolism. When exposed to AH vapors, humans develop irritation of the eyes, skin and respiratory tract. AH is an air pollutant emitted by cars and certain production facilities. It is also found in tobacco smoke. It's classified as a probable carcinogen. It's more toxic than ethanol and is responsible for many hangover symptoms. Acetic acid (CH3COOH) is produced naturally as fruits spoil. It freezes at 62°F. Vinegar is usually 4-8% acetic acid by volume. Ethanol promotes glycogenesis and inhibits gluconeogenesis, causing a drop in blood glucose. This stimulates glucagon production. Glucagon increases urea synthesis. Moderate ethanol consumption increases plasma HDL by increasing the transport rate of apolipoproteins A-I and A-II (components of HDL). Ethanol promotes free radical damage via several mechanisms, one of them being depletion of the antioxidant glutathione. Also, higher alcohols such as fusel alcohols and aldehydes, which are present in some alcoholic beverages, cause headaches. Ethanol transiently causes hypertriglyceridemia (excess blood TGs) by stimulating the liver to produce more TGs. It also reduces the amount of an enzyme that breaks down TGs. Over time this can lead to FA deposition in the liver (fatty liver). Ethanol inhibits enzymes needed for heart contraction, diminishes myocardial protein synthesis, interferes with calcium absorption, hampers the efficient metabolizing of FAs, constricts muscular blood vessels (while causing those at the skin surface to dilate), reduces the liver's ability to detoxify blood, raises plasma homocysteine, interferes with the metabolism of most vitamins and with the absorption of many nutrients, and stimulates urinary calcium and magnesium excretion. Tubulin is the protein that polymerizes into long chains (filaments) that form microtubules (hollow fibers that serve as a skeletal system for cells). Microtubules can shift through various formations, which is what enables a cell to undergo mitosis or to regulate intracellular transport. AH decreases the ability of tubulin to assemble into microtubules. This compromises raw material, and can cause brain cells' dendrites to atrophy and die off. AH easily combines with red blood cell (RBC) membrane proteins to convert the RBCs into "time-release capsules" for AH, releasing the AH far from the site where it attached to the RBC. As this happens, the membrane covering the RBC becomes stiffer. In order to travel through capillaries, RBCs must be able to fold or deform because the average RBC diameter is greater than that of a typical capillary. RBCs stiffened through chronic AH exposure will have difficulty deforming sufficiently to pass through capillaries, so oxygen delivery to many cells is reduced. Additionally, AH forms stable combinations with hemoglobin in RBCs. This reduces the ability of RBCs to accept, hold, and transport oxygen. The primary detoxification mechanism for scavenging unmetabolized AH is sulfur-containing antioxidants. The two most important are cysteine (a conditionally essential AA) and glutathione (a cysteine-containing tripeptide). They are active against AH (and formaldehyde) because they contain a reduced form of sulfur called a sulfhydryl group, which contains a sulfur atom bonded to a hydrogen atom. Sulfhydryl groups interact with aldehydes to render them incapable of forming cross-links. This scavenges AH. However, this aldehyde detoxification mechanism is easily overwhelmed by significant amounts of ethanol. Oxidized sulfur compounds (called disulfides) are inactive against aldehydes. Cystine, the oxidized form of cysteine, contains one disulfide group. Cystine can be reduced back to cysteine by vitamin C.
Typical doses of cysteine that are sufficient to block most of the toxic effects of AH are about 200 mg per ounce of ethanol consumed. However, the rapid assimilation and metabolism of alcohol requires both prior and concurrent dosing of cysteine to maintain protection. Furthermore, a multifold excess of vitamin C is required to keep the cysteine in its reduced state. Glutathione, the predominant sulfhydryl antioxidant in the human body, contains only 10% sulfur compared to 26% sulfur in cysteine. Much larger doses of glutathione must be taken to get the same sulfhydryl concentration, and a significant but unknown amount of glutathione is broken down in the stomach into its component AAs (glutamate, cysteine and glycine). Some sources believe that cysteine is an excitotoxin and can produce homocysteine as a by-product. N-acetylcysteine (NAC) is a derivative of the sulfur-containing AA cysteine. It is an intermediary (along with glutamate and glycine) in the conversion of cysteine to glutathione. NAC may be a preferred delivery system for cysteine because cysteine readily absorbs moisture and oxidizes, whereas NAC is more stable and may be better absorbed. Charcoal, often used as a detoxifier, absorbs the impurities in ethanol, not the ethanol itself. It also absorbs some vitamins and nutrients, robbing the body of them. Omega-6 FAs are easy to come by. Many nuts and vegetable oils (particularly safflower, sunflower, walnut, corn and soybean) provide LA. Mayonnaise, salad dressings, and other oily products are typically high in omega-6 FAs. Omega-3 FAs are less abundant. Several plant foods provide ALA, but the best source is flax (also called linseed), which is not commonly consumed in the U.S. Neither are the next best sources (perilla, chia, kukui [candlenut] and hemp). Flax seeds are about 20% ALA; flax oil is 57% ALA. (Flax also contains cancer-opposing compounds called lignans.) Marine fish oils provide EPA and DHA (most of which is formed in algae, plankton and planktonic crustacea, and then passed up the food chain). There are commercial flax and fish oil supplements. There are also omega-3-enriched eggs derived from hens fed a ration containing either microalgae, which increase the DHA content of the yolk; or flax, which increases the ALA, docosapentaenoic acid (DPA) and DHA content of the yolk. Evolutionary theory could explain our need for omega-3 FAs: Wild game (which cavemen hunted) has some ALA, as opposed to livestock, which has very little. Earlier, as sea creatures, our prey contained DHA and EPA. Fish oil generally does not contain mercury; rather, this toxic mineral binds to the flesh. Large, predatory fish such as tilefish (golden bass or golden snapper), shark, swordfish and king mackerel have the highest mercury concentrations. Grouper, orange roughy, marlin and tuna also contain significant amounts. (Canned light tuna has less than fresh or canned solid white tuna because it's composed of smaller species). Mercury levels in salmon are very low. The human requirement for omega-3 FAs is about 1-1.6g/day, which can be obtained from 5-8g (about 1.5 to 2.5 tsp) flax seeds, 1.7 to 2.7g (about 0.5 to 0.7 tsp) flax oil, 5-8g (1-2 tsp) cod liver oil, or 3-5g (0.5 to 1 tsp) salmon oil. Flax seeds must be ground or chewed very well because whole seeds are not digested. SFAs are found in both animal and plant foods. Even flax seed oil contains 9% SFAs. Stearic acid (18:0) is most abundant in cocoa butter (found in both dark and milk chocolate) and beef. Coconut oil and palm kernel oil have lots of lauric acid (12:0) and some myristic acid (14:0). Palmitic acid (16:0) is most plentiful in beef, lard, butter, palm oil, and cottonseed oil. Human body fat is 25% palmitic acid. Note 1: Coconut oil comes from the flesh of the fruit. The liquid in the center is not oil, and in fact is very low in fat. Note 2: Palm and palm kernel oils differ from each other. They both come from the oil palm (Elaeis guineensis), but palm oil is found in the fleshy portion of the fruit, whereas palm kernel oil is found in the kernel or the seed of the fruit. If SFAs were harmful to humans, evolution would probably not have established within the mammary gland the means to produce SFAs. Humans have eaten animal products – and therefore SFAs – for most of their existence. Because Darwinian selection pressure was exerted via health issues other than heart disease (when we lived only 35 years, atherosclerosis was not a factor), we needed SFAs for clotting ability and immune function. Nowadays physical safety, emergency medical care, and the availability of antibiotics make the procoagulant and antimicrobial properties of SFAs less important. Even so, the thrombogenic properties of SFAs can be offset by their boosting of the immune system because infections are atherogenic (see chapter 12). Butter increases TXA more than cocoa butter does, thus it is potentially more thrombogenic. TFAs occur occasionally in nature (usually in ruminant bellies). The most commonly known is conjugated linoleic acid (CLA). CLA is made from LA by flipping one of the double bonds in the LA molecule one carbon closer to the other one. This changes the 'methylene-interrupted' double bonds (three carbons apart) into 'conjugated' double bonds (two carbons apart). At the same time, one of the double bonds found in the cis configuration twists 180° to make it a TFA. Conjugated double bond systems might have antioxidant activity, and some studies suggest that CLA (found in small amounts in dairy and beef) can perform antioxidant functions, decrease body fat and inhibit tumor formation. However, other studies suggest that CLA increases oxidation; promotes vascular fatty streaks; or raises levels of insulin, BG or TNF-alpha. Furthermore, there are hundreds of molecules with antioxidant activity equal to or better than that of CLA. Palmitoleic acid (16:1) is an antimicrobial and an antioxidant. It is found in chicken, beef, mutton, macadamia nuts and sesame seeds. However, it raises LDL and lowers HDL. Erucic acid (22:1) is found in some plant-derived oils, including some varieties of mustard seed oil and high-erucic acid rapeseed (canola) oil. It might cause fatty deposits in, and inflammation of, heart muscle. Erucic and other very long-chain MUFAs can reduce the metabolism of other FAs. The erucic acid content of food-grade canola oil is supposed to be reduced to <1%. Oleic acid is found in many animal and vegetable foods, and is most concentrated in olives and olive oil. Human body fat is about 50% oleic acid. Virgin olive oil is obtained from olive fruits by mechanical or physical procedures exclusively, avoiding refining and high temperatures. The cardiovascular benefits of olives and virgin olive oil stem not from their high level of MUFAs (our bodies produce plenty of those), but from polyphenols. These antioxidants are widely distributed in vegetables and in the different parts of plants. Virgin olive oil is the only oil that contains significant amounts of polyphenols since they are practically lost during the refining process. Polyphenols present in virgin olive oil include hydroxytyrosol, tyrosol, oleuropein, quercetin, and many others. Hydroxytyrosol is believed to be the antioxidant with the highest free radical-scavenging capacity. It is the main polyphenol found in olives. It inhibits the production of hydroperoxides; and attenuates the cytokine-induced up-regulation of vascular adhesion molecules in endothelial cells, which can reduce the chance of atherogenesis. Olive juice (present in olives at twice the volume of oil) contains as much as 300 times more polyphenols, including a predominance of hydroxytyrosol-derived polyphenols, than the best extra virgin olive oil. Olives cannot be eaten raw due to the presence of a bitter substance, oleuropein. Bitterness is removed with either lye (sodium hydroxide) or brine (tap water or diluted brine). Lye-treated olives lose most of their polyphenols, minerals, etc. ; whereas these substances in brine-treated olives are simply diluted into the liquid. Olives start out green (due to chlorophyll) and turn pink, purple, and/or black as they age or ripen (due to the formation of anthocyanins). Black olives are fattier than green ones because oil content increases with maturation. They have more stearic and oleic acids. Green olives have more palmitic, linoleic and alpha-linolenic acids; and more vitamins, minerals, and AAs. Black olives have more polyphenols and flavonoids; green olives have only hydroxytyrosol. Green olive brine has more hydroxytyrosol than black olive brine has. Olives with their pits have more polyphenols than pitted have. Tocopherols are relatively abundant in crude vegetable oils. They are heat-sensitive and are practically destroyed during the refining process. We need to eat animal foods because most plant proteins lack one or more essential AAs. Protein complementation doesn't always work because some substances are found only in animal products. For example, taurine (which isn't a true AA because it contains a sulfonic acid group, rather than the carboxylic acid moiety found in other AAs). Taurine is not incorporated into proteins, but it is important for regulating heartbeat, maintaining cell membrane stability, and preventing brain cell over-activity. A deficiency can cause hypertension and atherogenesis. Our bodies synthesize some taurine from the essential AA methionine and the non-essential AA cysteine, but this ability is limited. Also, the glutamate in monosodium glutamate (MSG) competes with cysteine for cellular uptake, potentially decreasing taurine synthesis. Taurine is virtually absent in plants. It is found mostly in animal flesh (including fish) and eggs. It is plentiful in breast milk but not cow's milk. Eggs are the best source of protein in terms of both digestibility (how much we can absorb) and usability (essential AA proportions). Seafood is also a very good protein source, and is lower in fat (particularly SFA) than are livestock. Livestock are less digestible but still good protein sources. When animal or fish flesh is cooked at a very high temperature (char grilled) it forms mutagens called pyrolysates. Starchy foods such as bread, pasta, potatoes, and oatmeal have low glycemic indices and are therefore preferable to highly glycemic foods such as candy, cookies, pies, cakes, etc. Unfortunately even fruits can be highly glycemic due to their fructose content. Food preparation affects glycemic index because cooking makes foods easier (therefore quicker) to digest. For example, baked potatoes aren't as highly glycemic as mashed. Overcooking pasta raises its glycemic index. Several small meals rather than one or two large meals per day is much better in terms of BG moderation. White foods (bread, rice) are highly glycemic due to lack of fiber and germ, which would slow carbohydrate absorption. The less processed a food is, the better. Choose brown rice, whole wheat bread, etc. When the flour bleach chloride oxide combines with what proteins are left in the flour after removal of the bran and germ of the wheat, it forms a uric acid derivative called alloxan (C4H4N2O2), which destroys beta cells by initiating free radical damage to DNA, causing the cells to malfunction and die. For alloxan to cause injury to an individual's beta cells, the individual must have the genetic susceptibility to injury. Alloxan is used routinely in laboratories to make animals diabetic by causing selective necrosis of beta cells. There are other flour bleaches, but chloride oxide is the only one that produces alloxan. Vitamin E can reverse the effects of alloxan. However, there are more reasons to avoid white flour products. Removal of germ and bran causes the loss of virtually all the vitamin E and most of the calcium, phosphorus, iron, magnesium, manganese, potassium and copper. As a result, white flour contains almost nothing but highly glycemic starch. Processed foods often contain lipid peroxides, which produce free radicals within the body. Oleuropein, hydroxytyrosol and resveratrol reduce monocyte cell adhesion. Resveratrol, found in red wine, red grapes, blueberries, bilberries and cranberries, is an antibiotic compound produced as part of a plant's defense system against disease. Fungal infections are more common in cooler climates, so grapes grown in those regions have more resveratrol. It inhibits lipid peroxidation of LDL; prevents the cytotoxicity of OxLDL; and inhibits cyclooxygenase-1, an enzyme that converts arachidonic acid to inflammatory substances (however, as mentioned in chapter 6, cyclooxygenase-1 leads to the release of prostacyclin, a potent vasodilator and inhibitor of platelet aggregation). Nonsteroidal anti-inflammatory drugs (NSAIDs) reduce inflammation, pain and fever by inhibiting cyclooxygenases. Resveratrol is more concentrated in red wine than in white because the skins are removed earlier during white wine production, lessening the amount that is extracted. Grape juice, which is not fermented, is not a significant source of resveratrol. Resveratrol is unstable and oxidizes quickly. Eat a variety of foods. Different foods have different phytochemicals and other substances that, while not protein, fat, carbohydrate, vitamins or minerals, are important for optimal health. Hops contain flavonoid compounds such as xanthohumol that inhibit a family of enzymes, commonly called cytochrome P450s, that can activate the cancer process. Xanthohumol also induces activity in a "quinone reductase" process that helps the body detoxify carcinogens, and it inhibits tumor growth at an early stage. It is an antioxidant and can reduce the oxidation of LDL. However, the amount of xanthohumol needed in order to produce the beneficial effects requires the consumption of dozens of liters of beer per day. Legumes, whole wheat bread, brown pasta, citrus fruit, broccoli, cauliflower, squash, parsley, flax, pineapple and green tea have coumarins, which thin blood. Several fruits such as prunes, plums, raisins, grapes and apricots have antioxidant phenols. Blackberries, raspberries, strawberries, blueberries and cranberries have a high content of flavonoids, which scavenge free radicals. Grape seeds, and to a lesser extent skins, contain proanthocyanidins, which are much more powerful antioxidants than vitamins C and E.
Orange peel contains methoxylated flavone aglycones, termed the polymethoxylated flavones (PMFs), which fight cancer and inflammation, lower cholesterol, and inhibit secretion of apoB-100. The milk thistle plant contains the flavonoids silybin, silydianin and silychristin (collectively called silymarin), which are some of the most potent liver-protecting antioxidants known. They also stimulate the production of new liver cells; and cause the liver to increase production of glutathione, the body's most important antioxidant and detoxifying substance. The silymarin in milk thistle seeds is difficult to absorb. Virtually every fruit, vegetable, nut, grain and legume contains at least one beneficial chemical. Below is only a partial list. Eat foods in their natural form if possible (e.g. apples, not apple sauce) because processing removes most of these beneficial substances. Tomatoes Lycopene fights free radicals, cancer, heart disease and aging. Much more bioavailable in cooked than in raw tomatoes. Garlic Allicin fights blood clots, high blood pressure, fungal infections and stomach cancer. Onions, apples Quercitin fights cancer, circulatory disorders and heart disease. Onions also contain allicin. Chile peppers Capsaicin fights cancer. Cabbage, kale, Brussels sprouts Isothiocyanates fight cancer. Pineapples Bromelain fights blood clots. Prunes, plums Hydroxyphenylisatin stimulates colon and aids elimination. Neochlorogenic and chlorogenic acid absorb oxygen radicals. Grapes Ellagic acid fights cancer. Oranges Hesperitin, nobiletin, tangeritin, and limonoids fight cancer. Mangoes Cryptoxanthin fights cervical cancer. Soy Genistein fights cancer, stops smooth muscle cell proliferation. Not every natural substance is healthful. Many plant products such as soy, wheat, quinoa, rice, buckwheat, oats, rye, barley, millet, corn, peanuts, all dried beans, and butters and oils made from these foods, contain lectins, which may bind to glycoproteins found on surface cell membranes in arteries, organs and glands. This can stimulate smooth muscle cell growth, causing atherosclerosis; and begin antigen antibody reactions, causing "food allergies", autoimmune disorders and degenerative diseases. Castor beans contain a very deadly lectin called ricin. Aspergillus flavus and A. parasiticus fungi produce aflatoxins. They are detected occasionally in corn, peanuts, cottonseed and other foods. Aflatoxins cause liver damage, decreased milk and egg production, and recurrent infection due to immunity suppression. Some aflatoxins are carcinogenic. Powdered eggs, powdered reduced-fat milk, and meats and fats that have been heated to high temperatures, contain oxidized cholesterol, which injures arterial intima. Nitrates found in water, vegetables, and preserved meats and fish are reduced to nitrosamines in the gut. These generate free radicals. Plant sterols are similar to cholesterol but they are not absorbed. They're taken up by intestinal cells but pumped back out by a transporter protein called ABCG8 Transporter. While vitamin and mineral supplements are helpful, substance bioavailability (the amount absorbed) is usually better in foods. Many supplements use calcium fillers, so you can get calcium without taking calcium supplements per se. Mineral supplements combine minerals with another substance such as a salt (e.g. oxide, sulfate, aspartate, etc) to form a compound. The amount of elemental mineral and its bioavailability influence the effectiveness. Mineral oxides contain the most amount of mineral, but they have the lowest absorption rate; mineral aspartates have less mineral, but a higher percentage is absorbed. So which gives the greater net yield? This is a subject of debate. Note: The AA aspartate can be an excitotoxin because it is converted in the liver to glutamate (the universal excitatory neurotransmitter in the brain), so there is some debate as to whether mineral aspartates are safe. The worry about excitotoxins has also sparked much debate about the safety of aspartame (NutraSweet, Equal) and MSG: the former contains aspartate and the latter contains glutamate. If you want to avoid glutamate, don't eat processed foods containing "hydrolyzed vegetable protein". This brown powdery substance, added to enhance flavor, is made by a chemical process that breaks down the vegetable's protein structure to free the glutamate, as well as aspartate. Chromium is vital to proper blood sugar control. Without chromium, insulin's action is blocked and glucose levels are elevated. There are two forms of dietary iron. 1) Heme iron (found in hemoglobin and myoglobin) comes from meat, fish and poultry. It is much better absorbed than the other, and its absorption is not very affected by dietary factors. 2) Non-heme (elemental) iron comes mostly from fruits, vegetables, grains and eggs. Vitamin C strongly enhances the absorption of non-heme iron by reducing dietary ferric iron (Fe3+) to ferrous iron (Fe2+) and forming an absorbable iron-ascorbic acid complex. Absorption is inhibited by phytic acid (phytate), which is found in legumes, grains and rice; and polyphenols, which are found in some fruits, vegetables, coffee, tea, wines and spices. High doses of just about any supplement will result in reduced absorption or increased excretion, so megadoses are wasteful. Some substances can be stored, but that can lead to toxicity. There are many different chemical types of fiber, but the most important distinction is between soluble and insoluble fiber. Soluble fiber dissolves in water, forming a thick gel. Fruit pectin is a highly soluble fiber. Psyllium seed, the commonest source of bulk laxatives, contains fiber that is moderately soluble. Although all fiber adds bulk to bowel movements, the chemical effects of the different types of fiber can be opposite. Soluble fiber feeds the intestinal bacteria, which ferment it to produce short chain fatty acids (SCFAs). SCFAs nourish the cells of the large intestine, stimulating healing and reducing cancer development. When absorbed from the intestine, they travel to the liver and decrease the liver's production of cholesterol. Within the intestinal canal, SCFAs inhibit the growth of yeasts and disease-causing bacteria. However, high levels of soluble fiber supplements like guar gum encourage an overgrowth of normal intestinal bacteria, which deprives the body of vitamin B12 and increases the concentration of bacterial toxins. Excessive consumption of soluble fiber from supplements can create changes in the intestinal milieu that actually enhance the development of stomach or bowel cancer. Insoluble fiber does not feed bacteria well and is not readily fermented to SCFAs. It has little or no effect on blood cholesterol levels. However, it inactivates intestinal toxins, and high intake of insoluble fiber is associated with a decreased risk of colon and breast cancer. Supplements of insoluble fiber as wheat bran or pure cellulose appear to decrease the risk of bowel cancer. Insoluble fibers also inhibit the ability of disease-causing bacteria and parasites to attach themselves to the intestinal wall. Insoluble fiber plays an important role in preventing excess intestinal permeability. Soluble fiber is found in oatmeal, beans, peas, lentils, barley, citrus fruits, strawberries, apple pulp and other foods. Insoluble fiber is found in wheat bran, cabbage, beets, carrots, turnips, cauliflower, Brussels sprouts, apple skin and other foods. Fiber slows the absorption of high-glycemic-index foods. So, for example, the BG spike caused by a sugary dessert will be reduced if it's consumed after eating lentils or vegetables. Overengineered systems and redundant physiological capacities are essential for surviving long enough to reproduce in environments that are invariably hostile to life. Because humans have learned how to reduce environmental threats to life, the presence of redundant physiological capacity permits us to survive beyond the reproductive ages. One theory of aging involves telomeres, which are the caps at the ends of chromosomes. Every time a cell divides, telomeres shorten, eventually becoming so short that cells can no longer divide. As more cells reach the end of their telomeres and die, the process produces the effects of aging. Lean people tend to have longer telomeres than obese people have, and nonsmokers tend to have longer telomeres than smokers have. Telomere length is at least partly inherited. In the animal kingdom, long-lived species often have shorter telomeres than do short-lived species, indicating that telomere length probably does not determine life span. Telomere length plays a role in determining cellular life span in normal human fibroblasts and some other normal cell types. Experimental evidence supports the free radical theory of aging. Aerobic respiration, in which oxygen is used to break down organic molecules to release energy, produces free radicals, some of which diffuse through cells and into nuclei, where they damage DNA. There are two ways in which cells die: they are killed by injurious agents (necrosis) or they are induced to commit suicide (apoptosis). Necrosis occurs as a result of injury causing severe molecular and/or structural damage leading to progressive, irreversible and catastrophic metabolic failure. This results in membrane disruption, cell swelling and eventual cell lysis and fragmentation, with an associated acute inflammatory response. The cell death pathway switches on in certain cells and a cascade of proteases is activated, leading to lysis that results in rupture of a cell's plasma membrane, leading to the release of cytoplasm and the death of these cells. Apoptosis means programmed cell death characterized by an organized and controlled sequence of molecular and cellular events culminating in the removal of a cell from its potential or current function, without lysis or necrosis, thus avoiding inflammation. It is an active, genetically controlled process by which organisms regulate cell numbers, thus removing unwanted or damaged cells. All cells have the intracellular machinery necessary for apoptosis. Whether or not they use that machinery depends on the cell type, its tissue context, the presence or absence of physiological death-promoting signals, and the extent to which a cell is damaged or dysfunctional. The endocrine system regulates body composition, fat deposition, skeletal mass, muscle strength, metabolism, body weight and well-being. Some effects of aging are caused by reduced production of hormones such as DHEA, growth hormone, estrogen in females and testosterone in males. Why glands produce less of them as we age is a subject of ongoing research. Some believe that cumulative free radical damage to glands is responsible. Long-term exposure to hormones can cause cells to become resistant to them, resulting in functional decline even if hormone levels don't decrease. As DHEA declines but cortisol doesn't, the resulting increase in the cortisol/DHEA ratio in the blood is thought to be partially responsible for the catabolic state that develops during aging. As we age, arteries weaken due to fragmentation of elastic fibers and loss of smooth muscle cell nuclei. The body has 10 times as many bacteria as body cells. About 95% of human intestinal bacteria are obligate anaerobes, including Bifidobacterium, Clostridium, Eubacterium, Fusobacterium, Peptococcus, Peptostreptococcus and Bacteroides. 1-10% are facultative anaerobes, including Lactobacillus, Escherichia coli, Klebsiella, Streptococcus, Staphylococcus and Bacillus. Declining levels of Bifidobacteria in the elderly allow accumulation of toxin-producing Clostridia, which have been implicated in the development of cancer in the large bowel. The growth of Bifidobacteria in the large bowel is strongly affected by diet. Bifidobacteria thrive on vegetable fiber and on the complex sugars that occur in certain vegetables. These complex sugars, known as fructooligosaccharides (FOS), are especially concentrated in garlic, onion, artichoke, asparagus and chicory root. There are at least 56 species of Lactobacilli and many strains for each species. Some, like Lactobacillus acidophilus, are normal inhabitants of the human digestive tract. Others, like L. bulgaricus, which is a common starter for making yogurt, are not. L. bulgaricus disappears from the intestine within two weeks after yogurt consumption is stopped. Sauerkraut is sour because of L. plantarum, a beneficial organism that is normally found in the human intestine and that stays for a long time after being introduced. Commercially available fermented foods are unreliable as sources of Lactobacilli, because the lactic acid and hydrogen peroxide that Lactobacilli naturally produce may kill themselves if their concentration becomes excessive. Microflora reinforce the barrier function of the intestinal mucosa, helping prevent the attachment of pathogenic microorganisms and the entry of toxins or allergens into the bloodstream. Some enhance the immune system or act as antioxidants. Antibiotics can kill beneficial microflora. (They can also lower levels of almost every essential vitamin and mineral by interfering with absorption or increasing excretion.) Probiotic products can help restore microflora balance. Note that a lot of products contain only one or a few bacterial species, such as L. acidophilus. It is better to supplement with several species of Lactobacillus and Bifidobacterium. The immune system is the most diverse and ubiquitous system in the body. Its cells are divided into two main groups defined by their place of maturation: B-cell, or bursa/bone marrow-derived; and T-cell, or thymus-derived. B-cells are responsible for the formation of specific antibodies. T-cells are responsible for cell-mediated immunity and the production of chemicals and messenger molecules that kill the invading foreign materials. The first line of defense are nonspecific effector mechanisms, in particular the phagocytic (cell-eating) cells, such as neutrophils. Macrophages (big eaters) also play a role in phagocytosis, but may require activation. Some toxins will activate what is known as the complement system, a set of proteins that are designed to eliminate microorganisms and other antigens from tissues and blood. Enzymes, cofactors, receptors, and other molecules act in a symphony to elicit proinflammatory and cell-killing reactions in response to toxins. The deposition of fragments of complement proteins on the surface of invasive microorganisms is termed opsonization. This "tags" the cells so that phagocytic cells know to ingest and destroy that particular material. Activation of complement will also promote local inflammation at the site of infection, through the release of cytokines, interleukins, and TNF-alpha. The second line of defense is antigen processing. When a macrophage eats bacteria, proteins (antigens) from the bacteria are broken down into short peptide chains and those peptides are then "displayed" on the macrophage cell surface attached to special molecules called major histocompatibility complex class II (MHCII). Bacterial peptides are similarly processed and displayed on MHCII molecules on the surface of B-cells. When a T-cell finds the same peptide on the macrophage and on the B-cell, the T-cell stimulates the B-cell to turn on antibody production. The stimulated B-cell undergoes repeated cell divisions, enlargement, and differentiation to form a clone of antibody-secreting plasma cells. Hence, through specific antigen recognition of the invader, clonal expansion, and B-cell differentiation, an effective number of plasma cells all secrete the same needed antibody, which then binds to the bacteria, making them easier for white cells to digest. Immune cells are highly reactive and have a high turnover. Cytokines will produce free radicals to kill foreign cells in an oxidative burst of activity. Hence the very immune responses that protect us can also damage us (with free radicals). This is one way in which infections accelerate aging. Many micronutrients – particularly vitamins A, C, E and B6; and copper, iron and zinc – are essential for proper immune function. Other substances might be helpful. Echinacea may increase antibody production, but whether this is true is controversial. About 60% of the immune system cells are collected around the small intestine in areas known as Peyer's patches or the GALT (gut associated lymphoid tissue). Any thinning of the gut lining, such as in lactose intolerance, food allergy, gluten sensitivity, ulcerative colitis, Crohn's disease, antibiotic-induced colitis, yeast overgrowth, etc will render the gut leaky. This allows incompletely digested food proteins, which are immune-stimulating, to enter the bloodstream, causing an inflammatory response. Immune function is better in females than in males of many vertebrate species. This has been attributed to the presence of immunosuppressive androgens in males. Pathogens can initiate atherosclerosis by secreting toxins or antigens (e.g. myosin) that directly or indirectly (via cytokines) induce endothelial damage. They can exacerbate atherosclerosis by entering compromised tissue (Salmonella species show a proclivity for damaged vascular tissue) and causing inflammation, platelet adhesion, or autoimmune injury (due to similarity between microbial and host cell proteins). Infections in general are associated with arterial wall thickening, possibly predisposing arteries to atherosclerosis. Chlamydia pneumoniae (not to be confused with sexually transmitted Chlamydia trachomatis) – which causes approximately 10% of pneumonia (Streptococcus pneumoniae is the most common cause) – might promote atherosclerosis by causing platelet and leukocyte adhesion, smooth muscle cell proliferation (probably by stimulating the release of mitogenic interleukins) and the release of inflammatory cytokines. C. pneumoniae is found in atherosclerotic tissue ten times as often as in normal tissue, but this circumstantial evidence does not prove causation. Almost everyone becomes infected with this organism at some point. Other microorganisms possibly implicated in atherosclerosis include Heliobacter pylori (which causes ulcers), herpes simplex virus, and cytomegalovirus. The main mineral of the tooth tissues is a calcium phosphate salt, hydroxyapatite. The minerals in teeth are continually being dissolved out into saliva and added back. They dissolve in pH under 5.5 and remineralize in pH above 7. The chemical reaction below shows hydroxyapatite and acid on the left; and calcium, phosphate and water on the right. In low pH the reaction goes from left to right; in high pH it goes from right to left. The mixed bacteria resident in the mouth produce acid from fermentable carbohydrate, particularly sucrose (table sugar). They use the enzyme invertase to split sucrose into its component glucose and fructose molecules, which are then converted to lactic acid by the glycolytic pathway. Oral bacteria live in communities known as dental plaque, which accumulates on tooth surfaces. It begins with a pellicle (coating) that contains proteins and lipids from saliva and gingival crevicular fluid. Several bacterial species (mostly Streptococcus sanguis, S. oralis and S. mitis) attach to the coating using adhesins. They add extracellular polysaccharides that make a gluey mix, and other species attach to it. Streptococcus mutans and some Lactobacillus species are thought to be the most cariogenic organisms, but other species produce acids as well. The human mouth is sterile at birth; infection with S. mutans happens after baby tooth eruption by transmission from the mouths of parents or playmates. Repeated intake of sugar produces a frequent condition of low pH in plaque that demineralizes teeth, inhibits the growth of many healthful species, and selects for highly acidogenic (acid-producing) and aciduric (acid-loving) species such as S. mutans and Lactobacillus. High-molecular-weight polymers (such as starch and protein) have a minimal effect on plaque growth except when food is retained between and on teeth, because it takes a long time for salivary enzymes to break them down into bacterial food. Sucrose, in contrast, is a low-molecular-weight disaccharide that can be rapidly sequestered and utilized by the plaque flora. Plaque organisms capable of fermenting sucrose have a decided advantage over the non-sucrose fermenters in that they can proliferate during periods of sucrose ingestion and thereby become the dominant plaque organisms. Mouth pH drops to its lowest point – as low as 3.7 – within about 15 minutes after eating sweets. Then saliva washes away the acids and salivary bicarbonate slowly raises mouth pH until it reaches normal levels (about 7.0) about an hour later. However, plaque allows the development of an acid environment against the tooth surface, protected from salivary buffering. Normally, saliva replenishes tooth minerals. Salivary calcium and phosphate ions repress tooth mineral dissolution by mass action, and, if the pH is sufficiently elevated, replace lost tooth mineral. Additionally, a salivary aggregate consisting of a calcium phosphate carbohydrate protein complex (salivary precipitin) is deposited into and onto plaque and teeth. Demineralization surpasses remineralization under conditions of prolonged acidity. Frequent snacking on sweets (which feed acidogenic bacteria) without oral hygiene results in longer exposure of teeth to acid than does the consumption of three meals a day. Thus frequency of consumption is more important than amount. Inadequate salivary flow (xerostemia) accelerates demineralization due to insufficient pH buffering and mineral replacement. Acids can come from fruit juices (especially cranberry, lemon and lime) and fizzy drinks (even sugar-free varieties). Many cola drinks contain phosphoric acid. Vinegar (found in salad dressings, sauerkraut, pickles and cole slaw) is acidic. Fruits such as oranges, grapefruits, pineapples, apples, plums, apricots, pears, peaches, cherries, pomegranates, berries and grapes, and juices made from them, are acidic. The mouth should be rinsed with water or, preferably, a mixture of baking soda and water (baking soda is alkaline) immediately after consuming any of these items. Egg whites, corn, lobster, Camembert cheese, and graham crackers have pH greater than 7, so they might help remineralize teeth (but graham crackers also have sugar). Some oral microflora protect against caries by raising mouth pH. Streptococcus rattus can do so by catabolizing arginine via the arginine deiminase system. Other species secrete urease enzymes that hydrolyze urea (secreted in saliva and crevicular fluids) into ammonia. Saliva is an important source of nutrients and can sustain normal growth of microorganisms in the absence of exogenous nutrients. It contains water, carbohydrates, glycoproteins, proteins, AAs, gases, and several ions including sodium, potassium, calcium, chloride, bicarbonate, and phosphate. Water fluoridation has proven to be a cost-effective way of reducing caries. The apatite of newly formed teeth is rich in carbonate, has relatively little fluoride and is fairly soluble. Cycles of partial demineralization and then remineralization in a fluoride-rich environment create apatite that has less carbonate and more fluoride (the fluoride replaces hydroxyl groups in the tooth crystal, thereby forming fluorapatite), and is up to ten times less soluble. Hence children are more susceptible to tooth decay than are adults, and fluoride strengthens teeth. Also, fluoride that is ingested when the teeth are developing is incorporated into the structure of the enamel. Microbial acid production in the plaque may solubilize this enamel-bound fluoride, which could become lethal for the acid-producing microbes (fluoride inhibits the bacterial enzyme enolase, thereby interfering with production of phosphoenolpyruvate, a key intermediate of the glycolytic pathway). Such a sequence would discriminate against S. mutans and Lactobacillus because they, due to being aciduric, are likely to be the most numerically dominant at the plaque-enamel interface. The fluoridated tooth thus contains a depot of a potent antimicrobial agent that is most active at an acid pH. Once demineralization has progressed to the dentin (the inner part of the tooth), the damage is permanent. If bacteria reach the pulp it can cause a pulpal abscess, at which point a root canal or extraction is indicated, because the entrance to the pulp allows other types of more dangerous bacteria access to the jawbone, connective tissue, and bloodstream. The gingival crevice is normally not exposed to dietary components and saliva. It is bathed in crevicular fluid, which comes from plasma. The continuous flow of gingival fluid from the crevice to the oral cavity removes nonadherent bacterial cells. It contains many substances, including leukocytes and immunoglobins (which help fight infections) and nutrients (which feed organisms). Crevicular fluid flow increases greatly with inflammation induced by plaque accumulation (gingivitis). The gums become red and swollen and may bleed easily. Untreated gingivitis can advance to periodontitis in which plaque spreads and grows below the gum line. Toxins produced by plaque bacteria irritate the gums and stimulate a chronic inflammatory response in which the body turns on itself, and the collagen and bone that support the teeth are broken down and destroyed. Gums separate from the teeth, forming pockets that become infected. As the disease progresses, the pockets deepen and more gum tissue and bone are destroyed, often causing tooth loss. Periodontitis and pulpal abscesses can allow pathogens to enter the bloodstream and invade aortic, heart, and vascular endothelial cells, and produce vascular calcification. S. sanguis, S. oralis, Mycoplasma fermentans, and M. oralis share similar antigens with human tissue and may induce cardiovascular disease. Dental bacteria have been found on damaged heart valves of heart attack patients and in blood clots of stroke victims. Scientists have proven links between poor dental health and heart attacks, strokes, diabetes, pneumonia, and pre-term low birth weight babies. Additionally, CRP and inflammatory cytokines are released during periodontal flare-ups. Brushing and flossing are important, cost-effective, and easily performed activities that prevent caries and periodontitis. Hard bristles are unnecessary because plaque is soft and easily removed, and in fact soft bristles are preferred because 1) hard bristles can wear enamel off teeth, and 2) teeth are round and the bristles must be able to fold around them. Flossing removes food and bacteria between teeth and gums that toothbrushes cannot reach. Floss should be worked into each intertooth space, inserting it between the gum and one tooth and scraping the side of that tooth in a direction away from the gum (as in the illustration), and then repeating with the other tooth. Toothpaste should contain fluoride. Triclosan, found in Colgate Total, kills some oral bacteria, particularly S. mutans. Disclosing tablets can help reveal places where brushing did not remove plaque. These are small pills that are crunched after brushing. They turn plaque a bright color, usually pink. After brushing and flossing, rinse the mouth to remove remaining bacteria, food and acids. Water is fine. Adding baking soda raises mouth pH. Fluoride mouthwashes can help to remineralize enamel. Some antiseptic mouthwashes reduce the number of plaque bacteria. Those containing chlorhexidine are very effective, but can stain the teeth and affect the sense of taste in the long term. Listerine contains a bacteriocidal phenolic. The most important time to brush and floss is at bedtime because less saliva is produced during sleep. Ideally, teeth should be brushed and flossed after every meal. When this is not possible or convenient, rinsing the mouth vigorously with water will wash away some food, bacteria and acids. Chewing gum can help wipe plaque off teeth and stimulate salivary flow. Chewing gum should be sugarless. The least acidogenic sucrose substitutes are the polyols, such as sorbitol, mannitol and xylitol. Few plaque bacteria can ferment them, and those that can (S. mutans and L. casei ferment sorbitol and mannitol) do it slowly, because glucose catabolite repression keeps the necessary degradative enzymes at minimum levels. Xylitol, the only polyol with sweetness comparable to that of sucrose, and the only one that cannot be fermented by S. mutans, is anticariogenic. A sugar alcohol, it is derived mainly from birch and other hardwoods trees. It accumulates inside S. mutans and inhibits its growth. Long-term habitual consumption of xylitol appears to have a selective effect on S. mutans, resulting in selection for populations less adherent to tooth surfaces. Casein phosphopeptide, found in Trident Advantage chewing gum, can promote enamel remineralization. Oleanolic acid, oleanolic aldehyde, and 5-(hydroxymethyl)-2-furfural, found in raisins, inhibit the growth of S. mutans; as well as Porphyromonas gingivalis, which causes periodontal disease. Adipocyte A cell present in adipose tissue that stores energy as fat. Adipose tissue Loose connective tissue composed of adipocytes. Amino acid The basic structural building unit of proteins. Aneurysm Localized dilation or ballooning of a blood vessel. Arteriole A blood vessel that extends from an artery and leads to capillaries. Atheroma An abnormal fatty deposit that develops within an artery wall. Atherosclerosis Arterial disease involving intima damage, atheromas, calcification, and other factors that harden and/or weaken arteries and can lead to stenosis, reduced blood flow, high blood pressure, hemorrhage, ischemia and infarction. Capillary The smallest type of blood vessel. Connects an artery to a vein. Its wall is composed of a single layer of endothelial cells. It allows molecules such as oxygen, water and lipids to pass through by diffusion and enter bodily tissue. Waste products such as carbon dioxide and urea diffuse back into the blood to be carried away for removal from the body. Catecholamine A chemical compound derived from tyrosine that acts as a hormone or neurotransmitter. The most abundant catecholamines are epinephrine (adrenaline), norepinephrine (noradrenaline) and dopamine. Cholesterol A steroid, a lipid, and an alcohol. An important component of the membranes of all body cells, providing stability and making membranes' fluidity stable over a temperature interval. Chylomicron A large lipoprotein particle created by absorptive cells of the small intestine. Transports lipids to adipose tissue. Cortisol A hormone involved in the stress response. It increases blood pressure and blood sugar level, and suppresses the immune system. Cytokines Molecules secreted by cells in response to stimuli. Cytokines regulate communication among immune system cells and between immune cells and those of other tissue types. They mediate many functions including growth, development, wound healing and immune response. Cytoplasm A homogeneous, generally clear jelly-like "molecular soup" that fills cells. Consists of water, salts, organic molecules, enzymes and all organelles except the nucleus. Embolism Blockage of a blood vessel by a migrated embolus. Endocytosis A process whereby cells absorb material (molecules or other cells) from outside by engulfing it with their cell membranes. Epinephrine A hormone produced by the adrenal glands. Activated as part of the fight-or-flight response. Increases heart rate and stroke volume, dilates pupils, constricts arterioles in the skin and gut, dilates arterioles in leg muscles, increases glycogenolysis in the liver, and begins lipolysis in fat cells. Excitotoxin A substance that can damage or kill neurons by the overactivation of excitatory neurotransmitter receptors. Free radical A reactive atom with unpaired electron(s) in the outer shell. Gluconeogenesis Process of converting non-carbohydrates into glucose. Glycerol/glycerin A three-carbon alcohol to which fatty acids are attached in order to form lipids (fats and oils). Glycogen A polysaccharide that is the principal storage form of glucose in animal cells. Glycogenesis Process of synthesizing glycogen from glucose. Glycogenolysis Process of breaking glycogen down into glucose. Glycolysis A series of biochemical reactions by which a molecule of glucose is oxidized to two molecules of pyruvic acid. Hydrolysis Process in which a molecule is split by adding a molecule of H2O. Hyperglycemia Elevated blood glucose levels. Hyperlipidemia Elevated blood lipid levels. Hypertriglyceridemia Excess blood triglyceride levels. Infarction Tissue death due to obstruction of blood supply. Intima Innermost layer of an artery, the one that's in contact with blood. Ischemia Restriction in blood supply, causing tissue damage or dysfunction. Ligand An extracellular substance that binds to receptors. Lipid A molecule composed of glycerol attached to one or more fatty acids. Lipid peroxidation The oxidative degradation of lipids. Free radicals steal electrons from the lipids in cell membranes, resulting in cell damage. It most often affects polyunsaturated fatty acids, because they contain multiple double bonds in between which lie CH2 groups that have very reactive hydrogens. Lipolysis The breakdown of fat into free fatty acids. Lipoprotein A biochemical assembly containing proteins and lipids. Carries fats and cholesterol in the body. The proteins have charged groups aimed outward that attract water molecules, making them soluble in blood. Fats and cholesterol (not water soluble) are carried internally, shielded from blood. 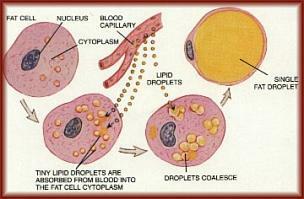 Lysis Process by which a cell releases biological molecules from inside itself. Macrophage An immune system cell that removes pathogens, dead cells and cellular debris by phagocytosis. Mutagen An agent that changes the genetic information (usually DNA) of an organism and thus increases the number of mutations above the natural level. Myocardium The muscular tissue of the heart. Oxidation A chemical reaction that adds oxygen to, or removes hydrogen or an electron from, a molecule. The reverse of reduction. Oxidative stress Cell damage caused by free radicals. Happens when reactive oxygen species production exceeds antioxidant activity. Phagocytosis Process where a particle is enveloped by a cell. Phospholipid A major component of all biological membranes. A lipid formed from four components: fatty acids, a negatively-charged phosphate group, an alcohol, and a backbone. Phosphorylation The addition of a phosphate (PO4) group to a protein or a small molecule. Phytochemical Plant compound that is not required for normal functioning of the body but nonetheless has a beneficial effect on health. It might promote immune function, inhibit microbes, reduce inflammation, neutralize free radicals, fight cancer or prevent atherosclerosis. Portal vein A vein that drains blood from the digestive system and its associated glands into the liver. Protease An enzyme that breaks peptide bonds in proteins. Protein A complex, high-molecular-weight organic compound that consists of amino acids joined by peptide bonds. Proteins are essential to the structure and function of all living cells and viruses. Reactive oxygen species (ROS) A free radical involving oxygen. Reduction A chemical reaction that removes oxygen from, or adds hydrogen or an electron to, a molecule. The reverse of oxidation. Stenosis Abnormal narrowing in a blood vessel. Stroke volume The amount of blood ejected with each beat of the heart. Thrombosis Formation of a clot (thrombus) inside a blood vessel.